Even though Peru has a huge coastline due to the Humboldt Current that dominates large parts of the Peruvian Coast, water temperatures for the Pacific Ocean are not the most comfortable. This is true from the border with Chile till around the city of Trujillo where this colder sea current turns away further from the coast. 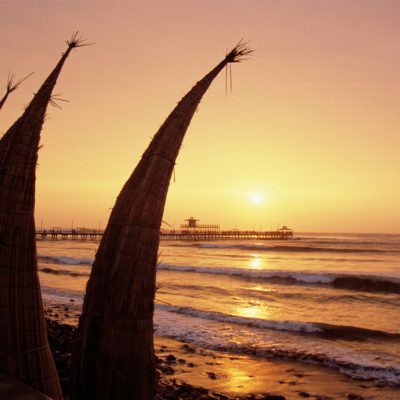 This means that the far north coast of Peru, close with the border with Ecuador has the best beach options in Peru. 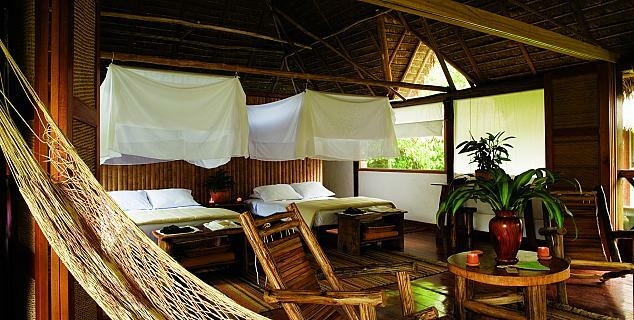 Also blessed with a warm climate throughout the year, this is the place to go for some down time on the beach. 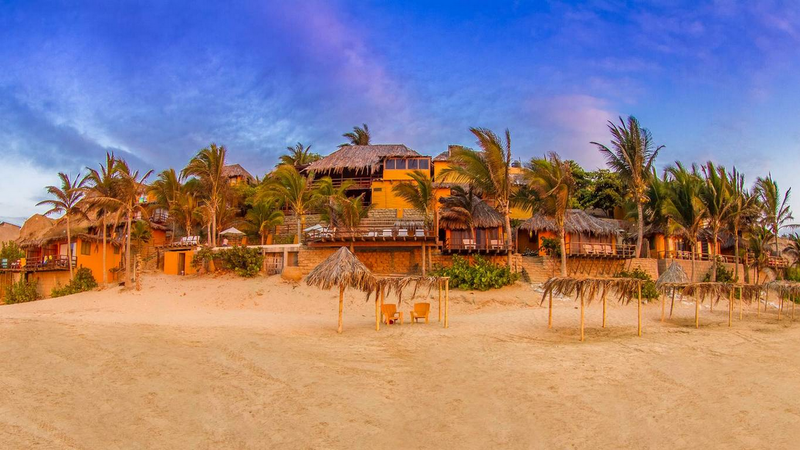 Mancora is probably the best known name but for those looking for a little quieter place to enjoy the beach, Vichayitos is probably your pick. 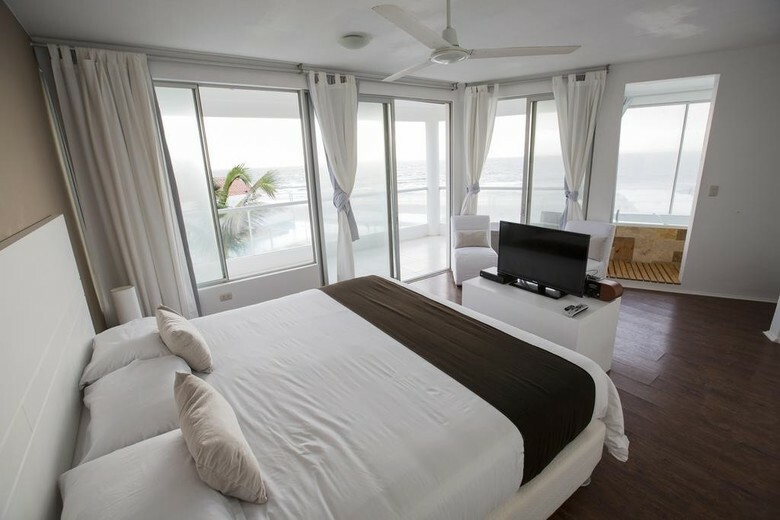 Following you can find some of our favorite Mancora Hotels . This list is of course far from complete so let us know if you would be interested in other properties as well. Mancora itself is not really the place you think of when talking history but nevertheless the region has its fair share of Peruvian History. 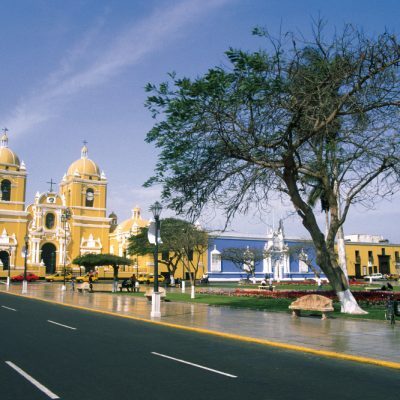 Piura, the largest city close to Mancora is the area where Francisco Pizarro set first foot on wall when arriving to Peru in 1532. It is here that one of the first churches on the South American mainland was built; the church of Colan, still standing till the day of today. In more recent times, in 1941, the area north of Mancora, Tumbes was involved in a violent border dispute with Ecuador. Mancora, a true beach village used to be a laidback fisher town till the beaches started receiving more and more visitors due to the nice beaches and good weather all year round. Nowadays most people in Mancora live from tourism but fishing is still the main industry in the region. Nearby Vichayitos is an even smaller town and is the place with the largest and nicest beaches. 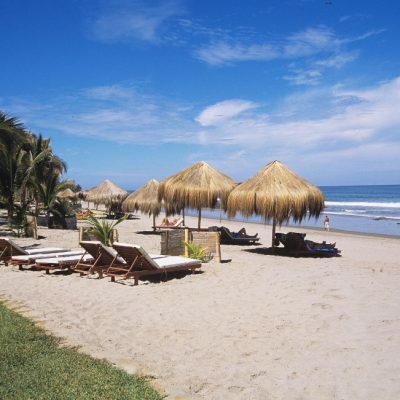 Mancora and Vichayitos are located on the Peruvian North Coast about 120km (75mi) from the border with Ecuador. The closest cities are Tumbes just before the border and Piura, about 180km (110mi) to the South. 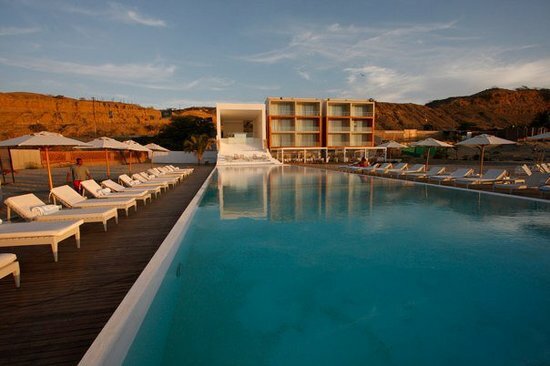 The geography around Mancora is a slightly hilly, dry desert landscape with the Pacific Ocean on one side and the gradual ascend of the Andes on the other. The region is crossed with rivers providing fertile lands in their meanders. The geographical position of the area, right at the confluence of the two large water currents on this side of the planet: the cold Humboldt current (coming from South) and the warm El Niño current (from North). The confluence of these two currents is responsible for the semitropical and dry climate, with on average more than 300 sunny days per year. 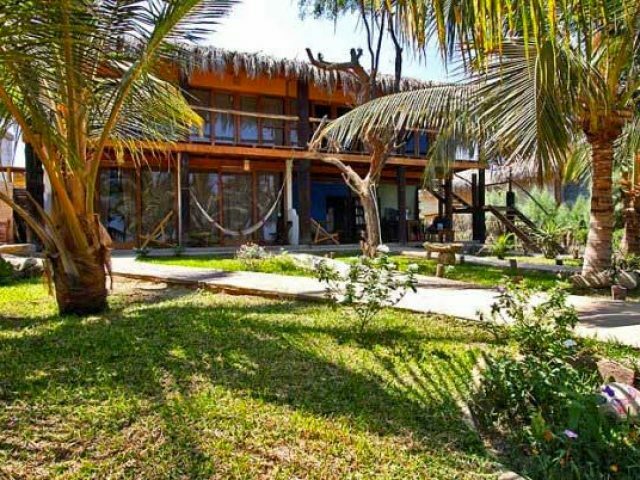 While on the beaches South of Piura they have a more temperate, desert like weather, the beaches north of Tumbes are warmer and very humid. Therefore Mancora and Vichayitos, due to its unique location enjoys the best of these two climate systems. 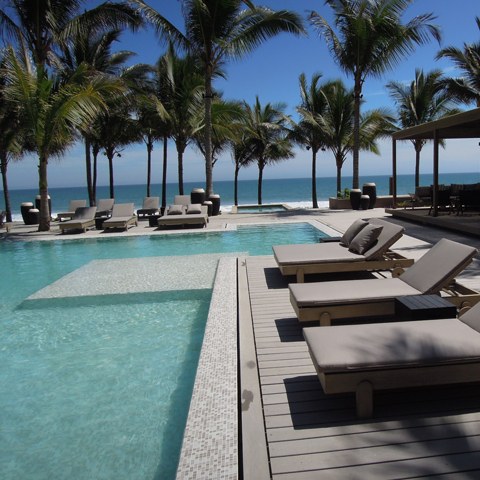 The main obvious reason to visit Mancora is for some beach & relax time. 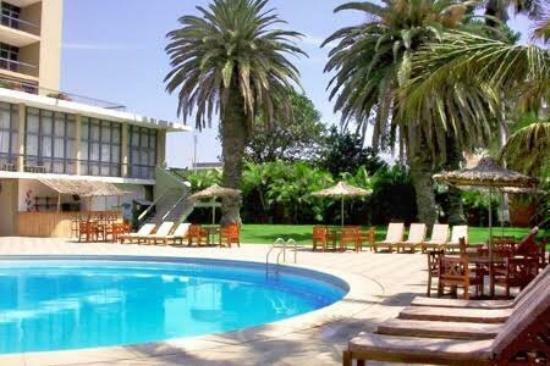 Some drinks at the swimming pool, some good seafood at a local restaurant, walks on the beach and perhaps some activities such as surfing, kitesurfing, bodyboarding or horseback riding. Sounds like a perfect recipe. 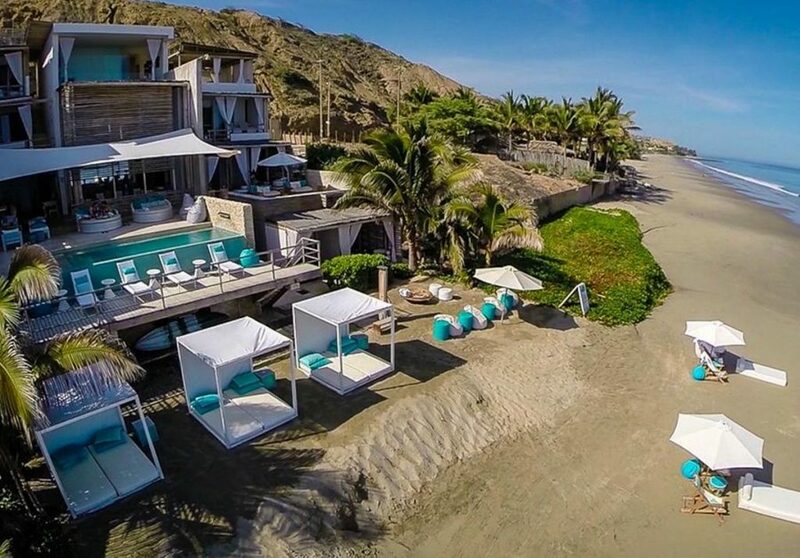 Mancora is known worldwide for its surfing and great waves all year round. 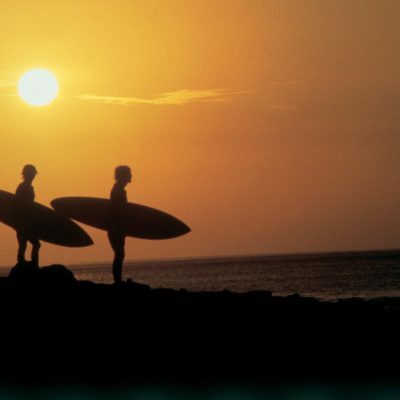 The waves close to Mancora are also ideal for beginners and there are several surfing schools in town. For those who, apart from the all the above, feel the need to undertake some excursions; in the months July and October the region is visited by large schools of whales passing through making it an excellent time for whale spotting. Seeing these giants up close does put things in perspective. Another interesting excursion is a visit to the Manglares de Tumbes; these swamplands are home to hundreds types of birds as well a crocodile farm. 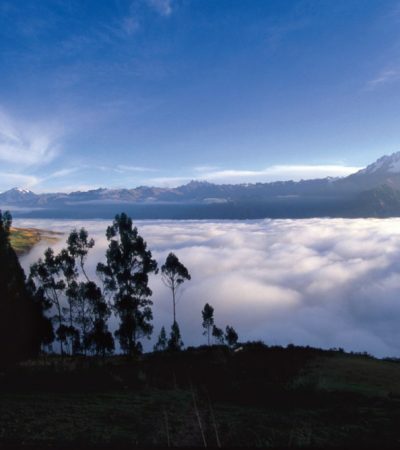 The Peruvian Northern Highlands are the common name for the central / northern part of the Peruvian Andes. 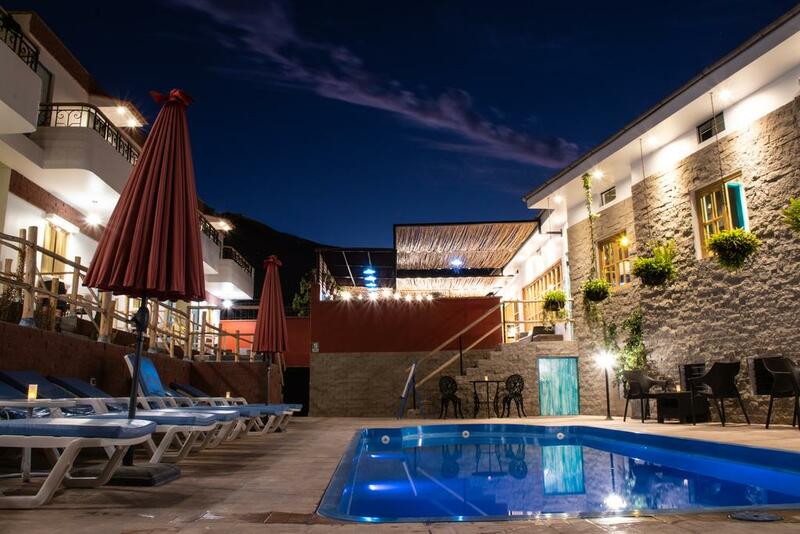 With cities such as Huaraz, Chachapoyas and Cajamarca as great exploration base, the region has so much to offer it would easily be the highlight of any country. (Un)fortunate due to Machu Picchu few people come to this region, making it all the more worth exploring. Amazing archaeological sites, for once not from the Inca such as Kuelap and el Chavin de Huantar, Peru’s highest Mountain the Huascaran at 6,768m (22,000ft) or the world’s most beautiful mountain the Alpamayo can be found in the Cordillera Blanca. Other unique sites are the avenue of the waterfalls with several waterfalls well over 700m (2,200ft) high and unique ecosystems or the ransom chamber and Baños del Inca in Cajamarca. For the lucky few who take the time to visit the Northern Highlands you will realize that this is perhaps the most beautiful part of the country yet. 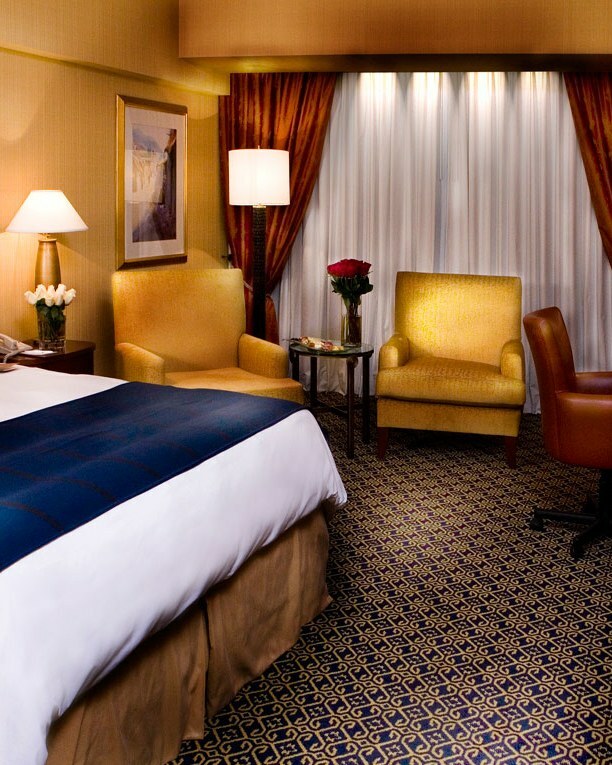 Following you can find some of our favorite Northern Highlands Hotels. 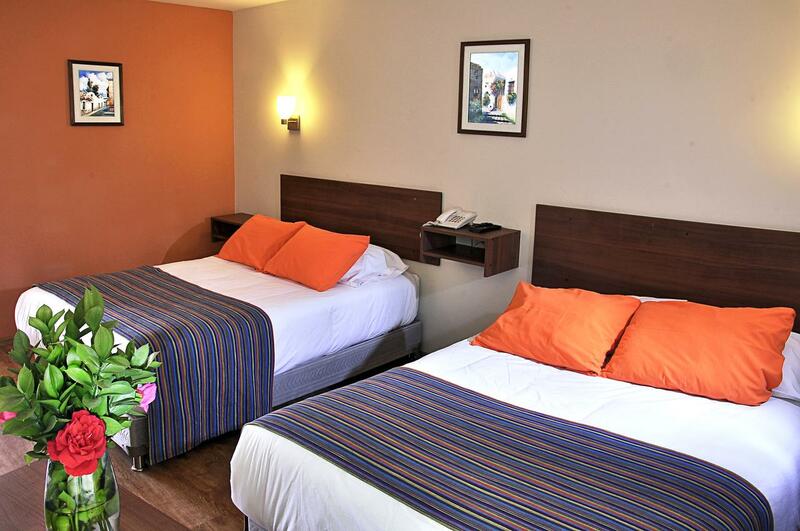 Please note that these are located in different cities such as Huaraz, Cajamarca and Chachapoyas. This list is of course far from complete so let us know if you would be interested in other properties as well. The Peruvian Northern Highlands are a very diverse region; not only for its geography but also for its history. With the ancient cultures of the Chavin de Huantar estimated to go back to about 500BC or the Inca contemporary site of Kuelap next to hundreds of smaller ruins and sites from other cultures, it is obvious that this region was no different than other regions in Peru with a huge wealth of history. 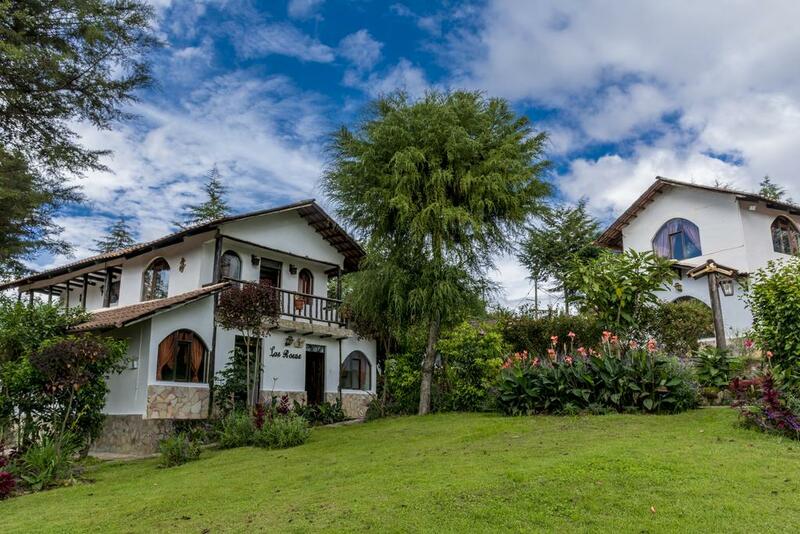 Nowadays it is especially the Chachapoyas Culture that takes the spotlight in the northern highlands as they are known as one of the few cultures that have withstood the pressure of the contemporary Inca culture. Even though not completely true –there have been found architectonic proof that the Chachapoyas have been introduced to Cusco for instance – the Chachapoyas were one of the few cultures that during the reign of the Incas were allowed to maintain a large part of their own culture and were not subject to the obligatory workforce the Incas used as a way of levying taxes. 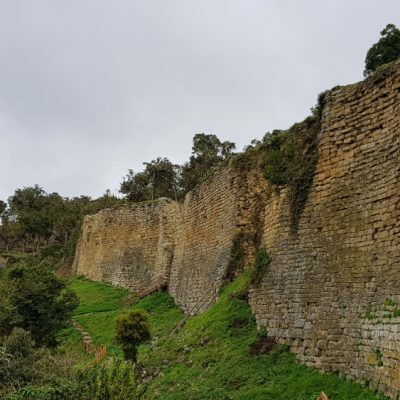 The Chachapoyas left behind many smaller sites but the most important one is Kuelap, probably the only site in the Andes that can compete with Machu Picchu and Choquequirao when it comes to grandeur. The main foothold for the Inca in the Northern Highlands was Cajamarca. Cajamarca was Peru’s second largest Inca city and for some time contested when the huge empire split in two in a civil war with Quito the capital of the northern empire and Cusco of the southern empire. 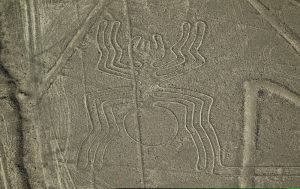 This was the time that the Spanish also set foot on wall in north Peru. Hearing about an army station in Cajamarca the Spanish marched to Cajamarca and almost immediately decimated the entire army of the Inca Empire and with this gaining grant advantage for the execution of the rest of history as we know now. The Northern Highlands are as the name indicates located in the highlands with altitude ranging from 500m (1,600ft) to 6,700m (22,000ft). In this region it is most the two cordilleras that create the countryside. 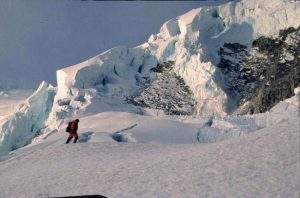 The older Cordillera Negra and behind it the higher and more extreme Cordillera Blanca. Further north this geography is also influenced by the large Marañon River running to the Amazon Basin as well as the highlands around Cajamarca. 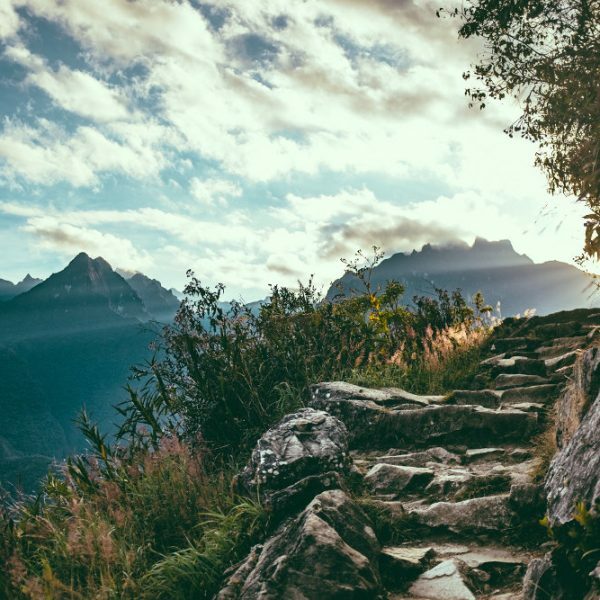 Due to less tourism, infrastructure in this part of Peru is at times less developed making that getting around can be a little more challenging and time consuming. The main roads coming from the coast is the road from Chiclayo to Chachapoyas and from Trujillo to Cajamarca. 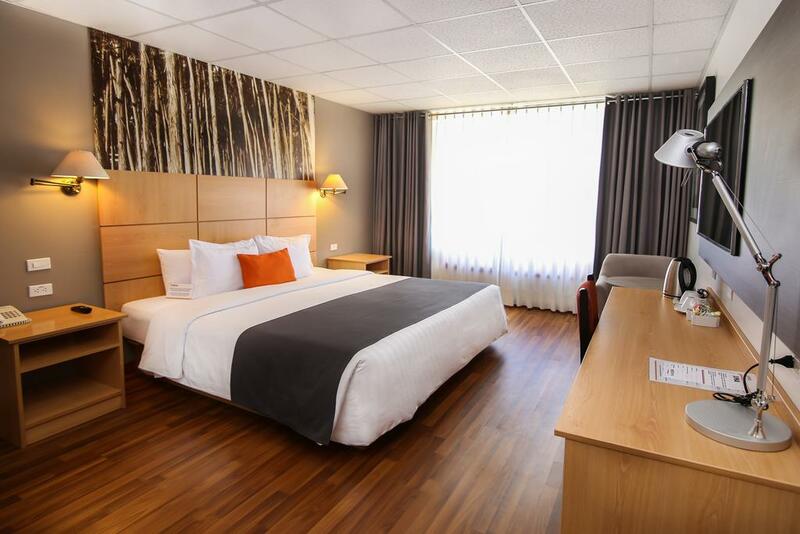 Main airports of the zone are the airports of Cajamarca, Jaen, Jauja and Chachapoyas. 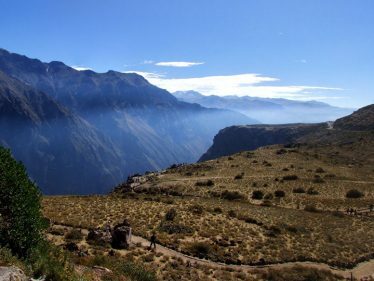 For those looking to hike, especially multi day hiking North Peru is the place to be. 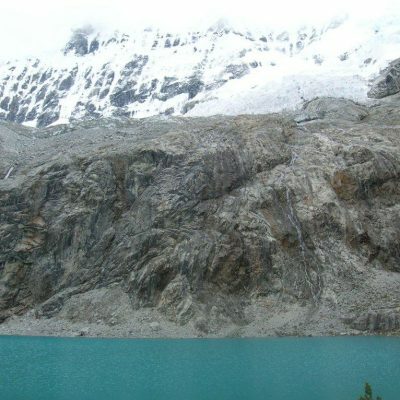 Smaller hikes such as Lagoon 69 or longer hikes such as the Santa Cruz or the Cordillera Huayhuash hike are just some of the many options the Cordillera Blanca and Negra offer. 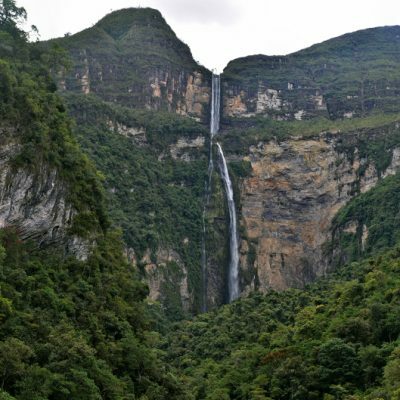 For lower altitude hiking and amazing nature, try the valley of the waterfalls with the Gocta and Yumbilla both well over 700m high being the most impressive falls of the region. For the archaeology buffs the main sites on the bucket list for this region are Kuelap, the city of Cajamarca and Chavin de Huantar. For those with more time the Sarcophagus of Karajia, Sechin Alto or Kuntur Wasi are also worth the visit. 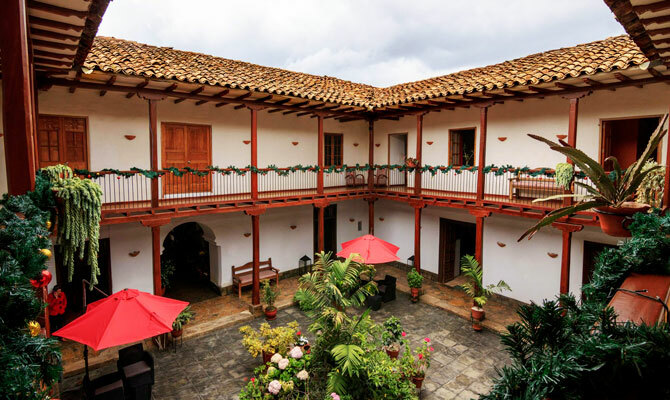 For those looking for nice cities; the Inca city of Cajamarca is a point of reference culture wise in North Peru and the sleepy colonial atmosphere of Chachapoyas is also definitely addictive. 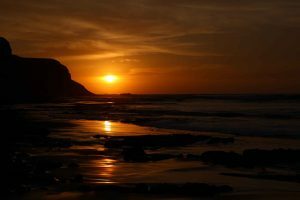 The very interesting Peruvian north coast is one of the lesser known travel regions in Peru. This is fortunate for those willing to come here as you will find impressive archaeological sites with hardly anyone else, beautiful authentic cities, deserted beaches and some of the best gastronomy of the country. So if you would like to see a different and lesser traveled part of Peru the North Coast may just be up your ally. 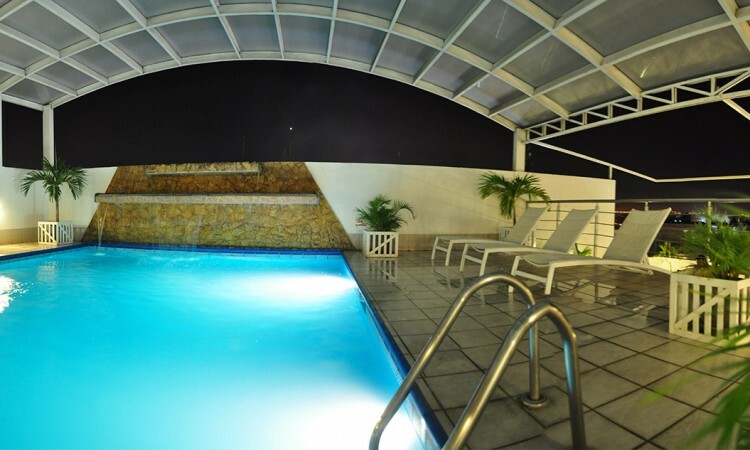 Following you can find some of our favorite North Coast Hotels either in Trujillo or Chiclayo. This list is of course far from complete so let us know if you would be interested in other properties as well. The Peruvian North Coast is probably the region of Peru with most “proven” history. The finds that have discovered in this part of Peru are only surpassed in importance perhaps by the great finds in Egypt or Mesopotamia. Caral, located north of Lima has been estimated to date from around 3,000 and 1,800BC and therefore is contemporary with the first primitive civilizations of the world and by far the oldest archeological site found in the Americas. 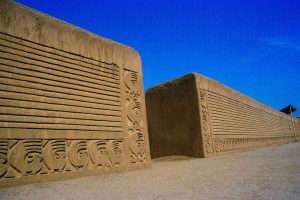 Further north we find the impressive remains of two other cultures; the Moche and Sican Cultures. The Moche lived around what is nowadays Trujillo and the Sican around nowadays Chiclayo. Between these two cities one can easily find hundreds of archeological sites going back from 500AD till about 1500AD. Places such as Chan Chan, the Pyramids of Tucume, the Sun and Moon Temples, the Lady of Cao, and the Señor de Sipan are all amazing sites and ruins that allow you to grasp the importance of this area for the development and evolution of South America and its culture. The North Coast is similar to the South Coast with large desert plains next to the coast but the inland is somewhat larger and greener with the Andes Mountains pushed somewhat further back to the East. The rise of the Andes is also less sudden making space for larger meanders creating fertile agricultural areas. This is probably also one of the reasons the North Coast has such an astounding amount of ancient cultures that roamed these lands. People have been living here for thousands of years but mostly close or next to the fertile riverbeds coming from the Andes and flowing the Pacific Ocean. The attractions of the Peruvian north coast are legion but most visitors will come to the region to visit the impressive archaeological sites from ancient cultures that once roamed these lands. The Moche with their impressive site of Chan Chan and the Temple of the Sun and Moon; the Chimu who left behind a staggering 22 pyramids around Chiclayo or the recently discovered site of the Lady of Cao where the actual mummy is still present. 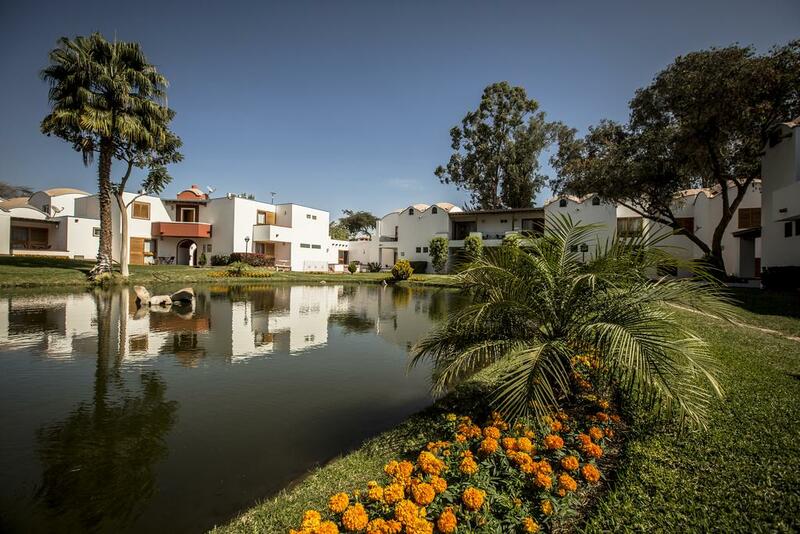 City wise it are Trujillo and Chiclayo that take the limelight. Two very agreeable and friendly cities. 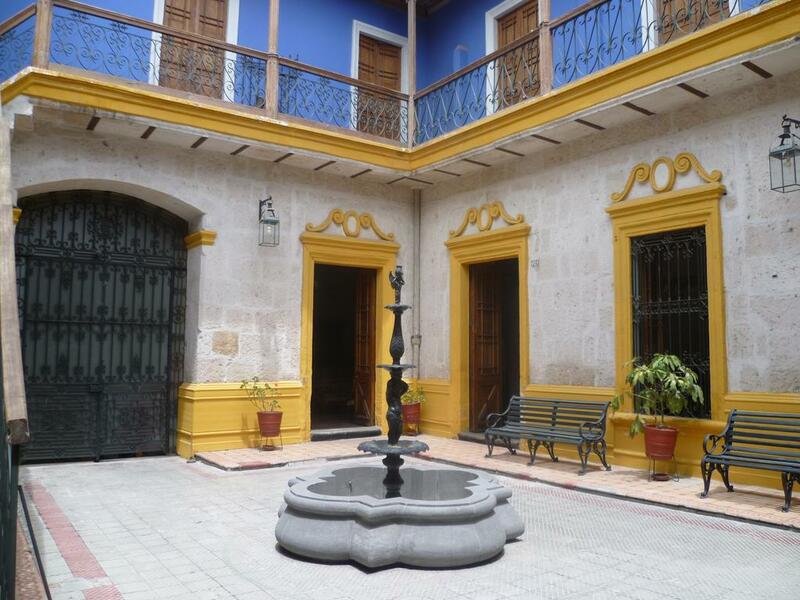 Trujillo especially has a colonial city center that impresses with its lively colors and beautiful mansions. 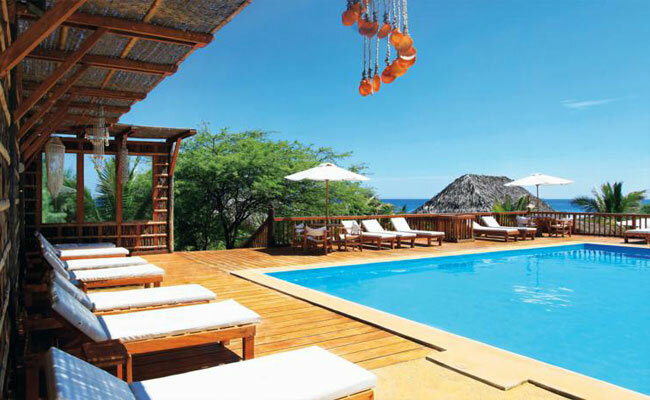 As you are at the coast obviously it is nice spending time in the sometimes sleepy coastal towns such as Huanchanco or further north Colan and Cabo Blanco where Hemmingway supposedly wrote the Old man and the Sea. 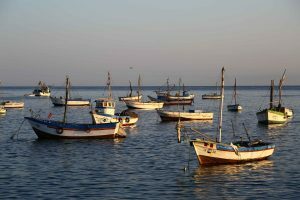 With the sea present it should not be a surprise that culinary the region also has a lot to offer; amazing seafood or some typical criolla dishes such as Arroz con Pato really stand out in this region. 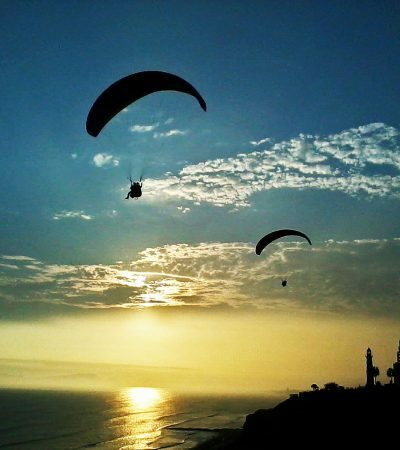 The Peruvian South Coast refers to the coastal area south of Lima and some of Peru’s biggest attractions. 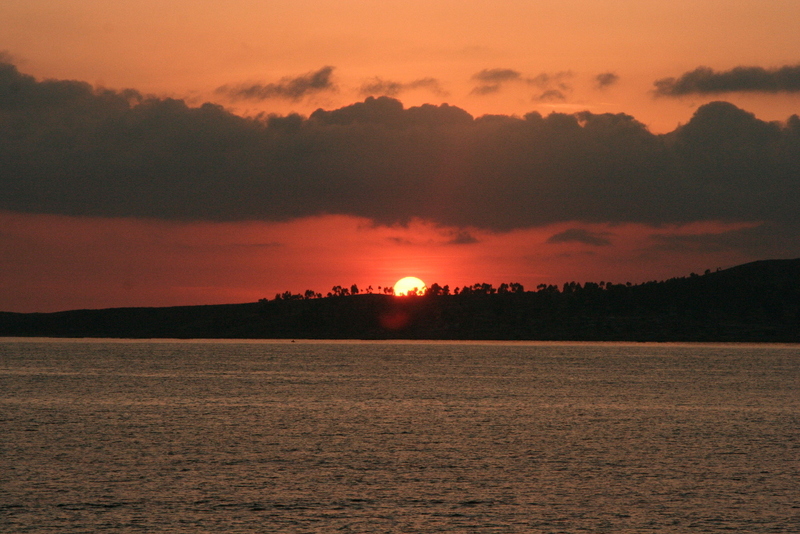 The South Coast is yet another type of Peru and a possible destination just by itself. 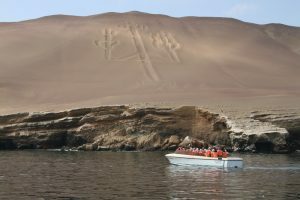 The Peruvian South Coast can be divided into three separate regions; Paracas, mainly known for the Ballestas Islands and National Park; Ica, known for Huacachina and its bodegas and Nazca famous for its huge Nazca Lines and the nearby Chauchillas Cemetery. 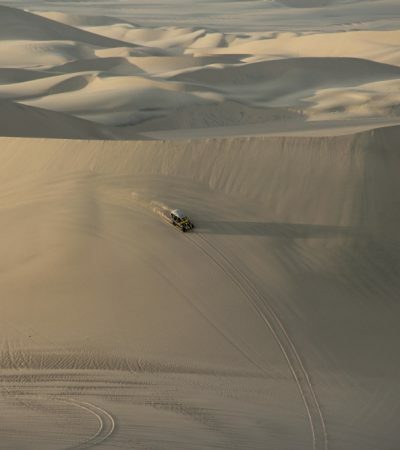 So whether you would be looking to fly the Nazca Lines, enjoy a boat trip to the Ballestas Islands, enjoying the desert in a dune buggy or enjoy some of Peru’s finest wines and Pisco’s; this is the place to be. These incredible activities combined with some excellent gastronomy and the great climate the Ica region is known for make some amazing and fun days. 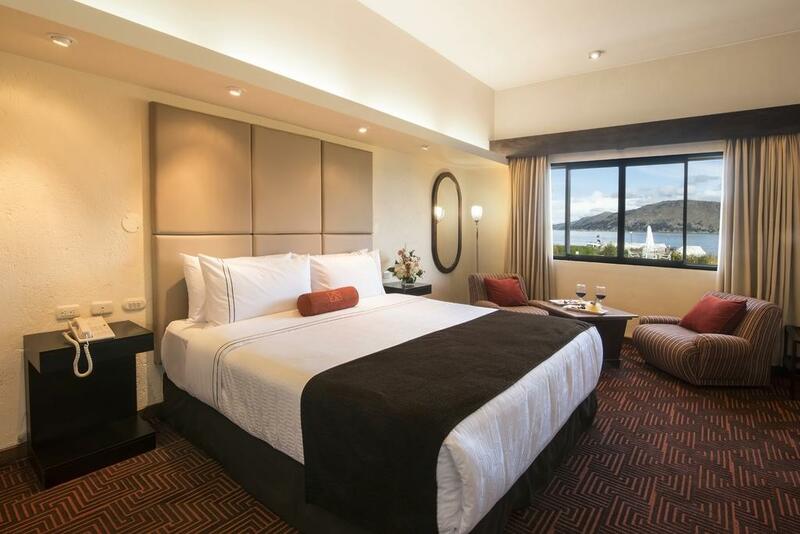 Following you can find some of our favorite South Coast Hotels. These can be in three different locations. This list is of course far from complete so let us know if you would be interested in other properties as well. The Peruvian South Coast History goes back thousands of years with ancient sites and temples being found all over the Peruvian South Coast. 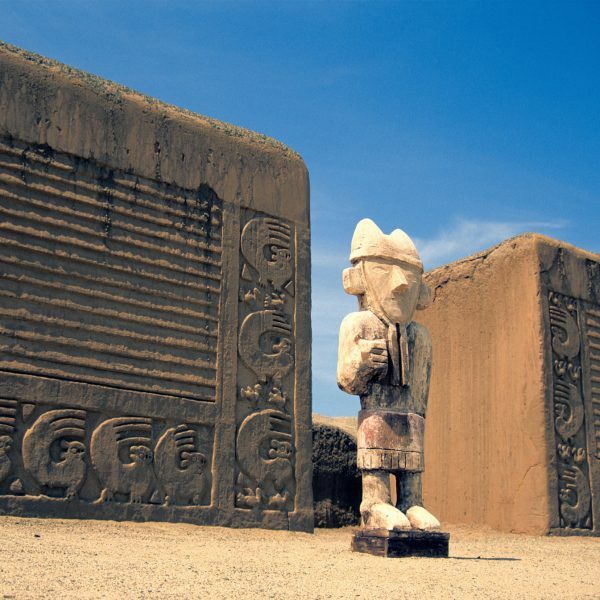 With several dozens of Huacas or ancient burial temples as well as the old Inca sea port of Puerto Inca and the famous Nazca Lines and Chauchillas Cemetary, the Peruvian South Coast is scattered with history. But not only dry history; for one reason he Peruvian South Coast is full of mystery; ancient cultures that left behind artifacts or accomplishments historians nowadays do not know what to think of. In Paracas one can find the museum of the elongated skulls for which no clear explanation has been found; the Nazca Lines have been researched for decades and little is known about the lines or the culture that created them; the underground channels in the outskirts of Nazca and the sheer number of Huacas found in the region make that this is still a very new territory with a lot of questions marks. The Peruvian South Coast is perched in between the Pacific Ocean on one side and the start of the Andes Mountain range on the other. The area is generally flat with the outskirts more mountaineous towards the Andes. 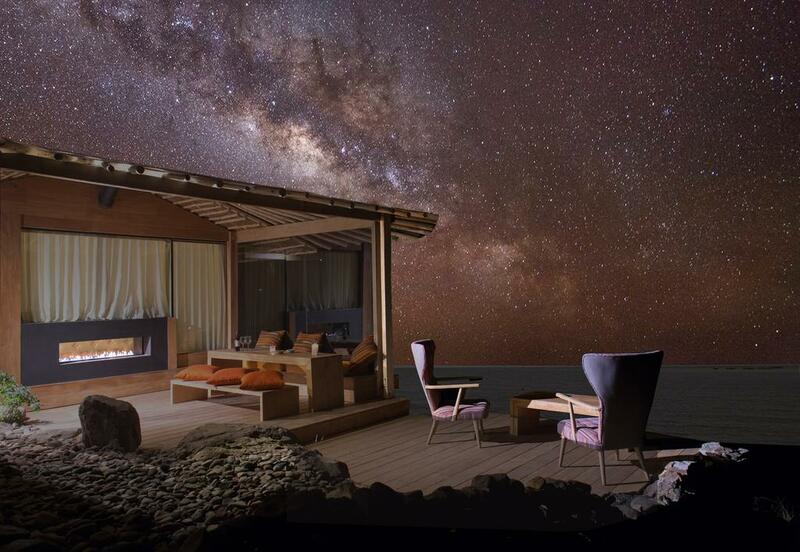 The whole region is still part of the might Atacama Desert running from North Chile till the Lima area and therefore is characterized by large flats of either sand or stone undergrounds. The large plains of the region around the rivers coming from the Andes are the ideal underground for the pisco and vineyards that are so often found in the region. 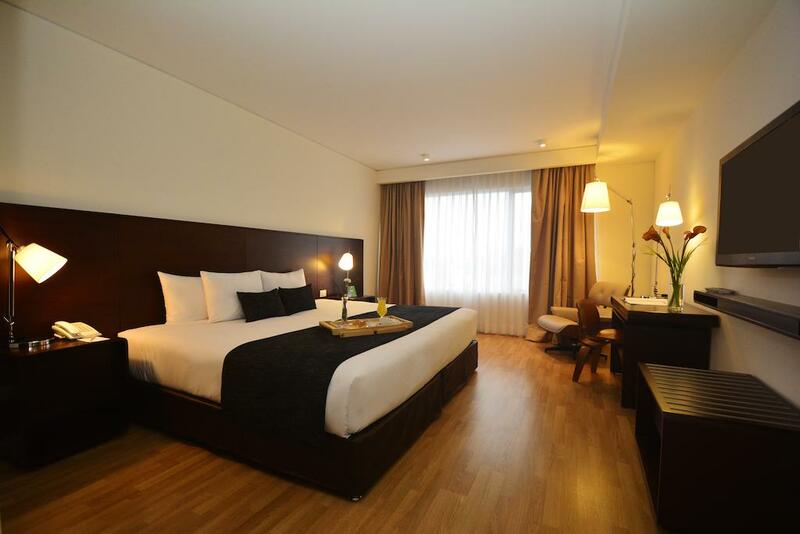 The bigger cities of the region are Ica and Nazca, located at about respectively 4 and 7 hours’ drive from Lima. The region is connected by one main road the Panamerican Highway which runs all along the coast of Peru. Even though this being the longest highway in the world, for large parts this highway runs through villages where it is used as the main road with the obvious inconveniences as a result. 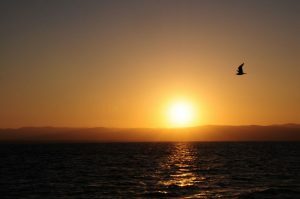 The Peruvian South Coast and its attractions can best be divided into three regions; Paracas, Ica and Nazca. 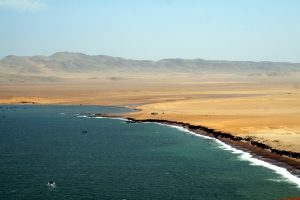 The Paracas region is best known for the Ballestas Islands where one can see sea lions, penguins, dolphins and several other marine life. 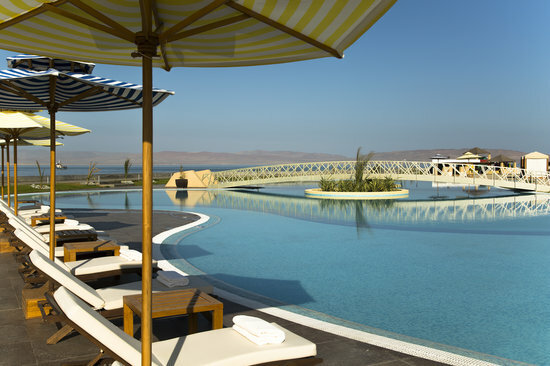 The Paracas National Park is also worth the visit with its deserted beaches and great birding. 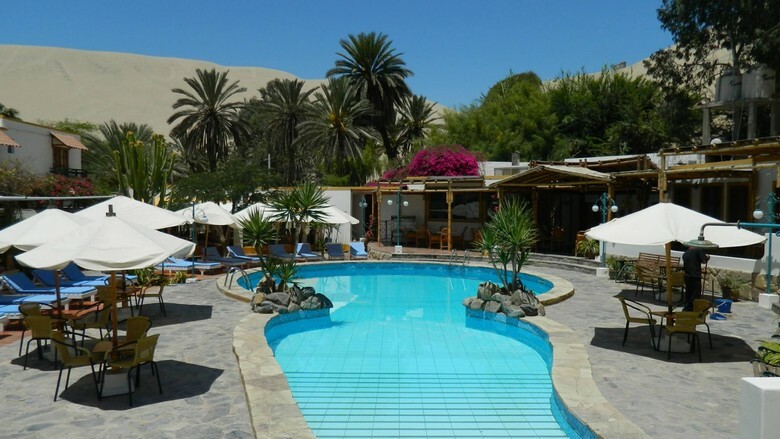 Ica must be visited in order to see the natural oasis of Huacachina; a fata morgan like place smack in the middle of some huge sand dunes. The surrounding desert is no less impressive nor is its sunset. 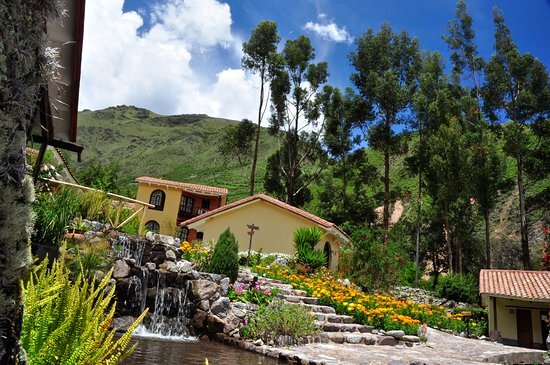 Around Ica one can also find Peru’s most important wineries and Pisco bodegas, several of these can be visited. 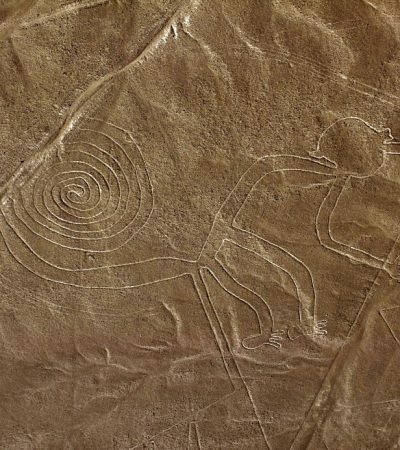 In Nazca we find the famous Nazca Lines; these geoglyphes have been here for hundreds of years and so far no reasonable explanation on how they were created or why has been formulated. These can be seen from the viewing platform but the only real way to see the lines is by flying over them. Also in Nazca we can find the creepy Chauchillas Cemetery; an open field in the desert with open graves that graverobbers left behind and where one can still see the original mummies of these ancient cultures sitting in their graves. 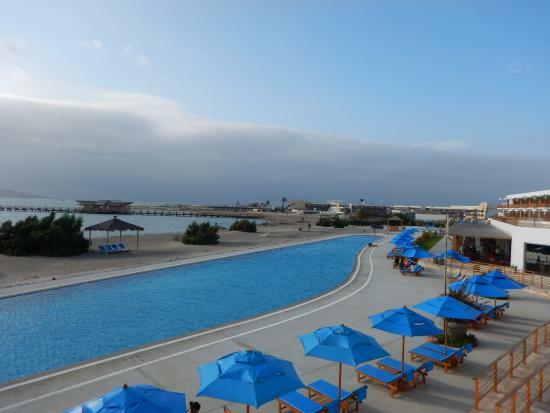 As you can see there is plenty to do on the Peruvian South Coast. 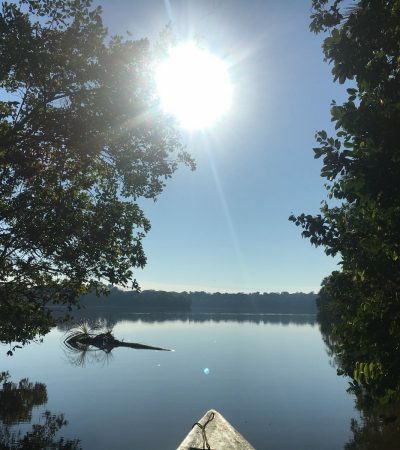 The Amazon River is an enigmatic name for anyone with some geographic interest being one of the largest rivers in the world and source of great adventures. 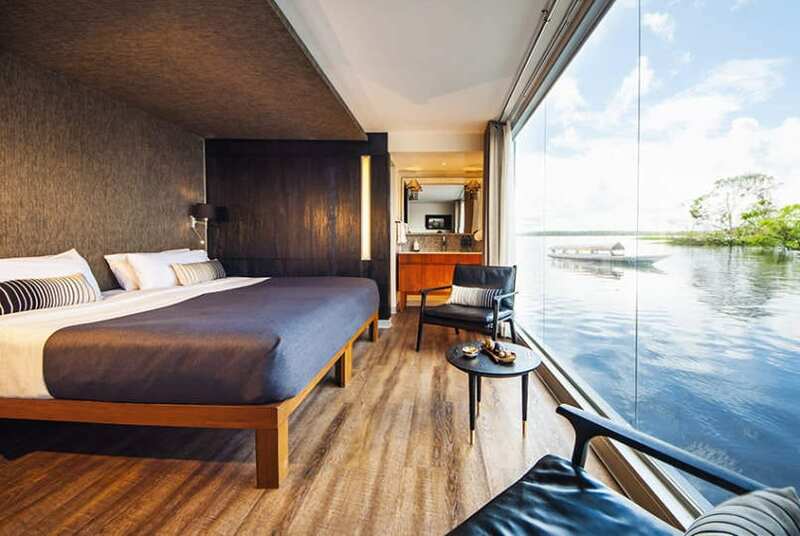 Iquitos is Peru’s prime city when it comes to visiting the Amazon River and quite a unique destination in itself. 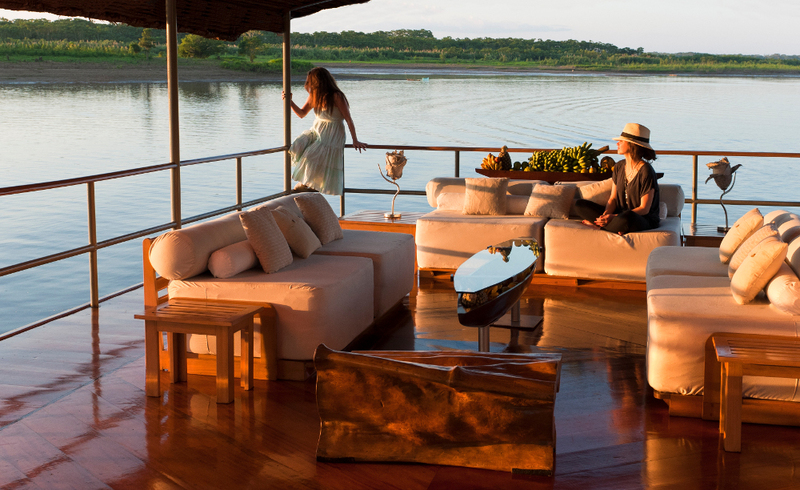 The city is the starting point for jungle cruises as well as many of the different jungle lodges around. 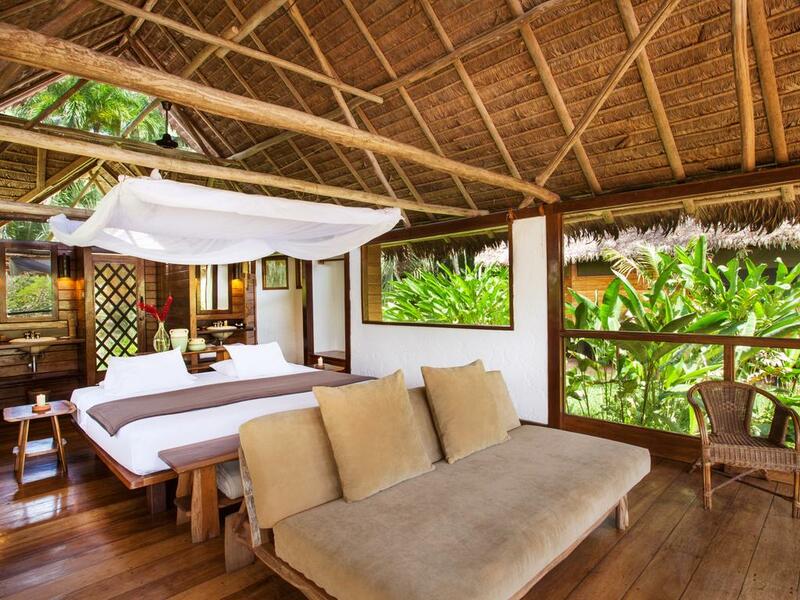 These organized jungle experiences will give visitors the best chance on seeing the local fauna and flora up-close. It is not recommended to head into the jungle on your own account. The city itself is a fascinating place that still breaths a lot of adventure and makes you feel you are in a unique place on the planet. 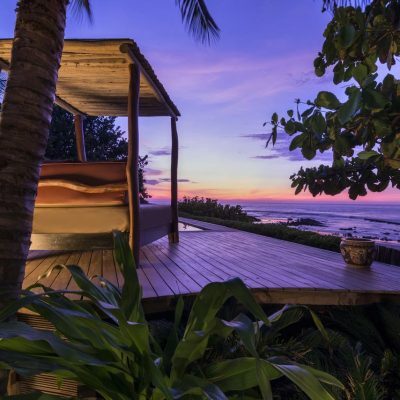 The weather is hot and humid with showers all throughout the year – which for this tropical destination is not a bad thing. 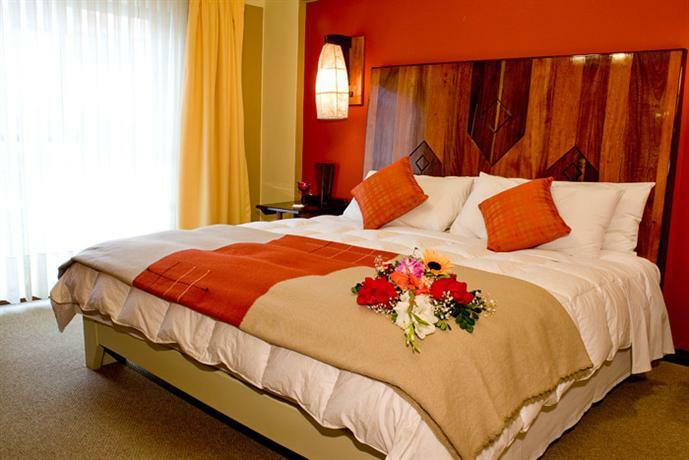 Following you can find some of our favorite Iquitos hotels as well as jungle lodges and cruise ships. This list is of course far from complete so let us know if you would be interested in other properties as well. Before the conquest the Amazon Basin was very much undiscovered and known to the world. It was a huge dense forest with a lot of dangers and it took quite some time before the Spanish became interested in the region. The basin was populated by small tribes that lived a life of nomadic hunter-gatherer but intertribal communication there was little. When the Spanish arrived in 1532 in Peru they focused first on the coast and highlands in search for gold but in a later stage also turned to the Amazon as perhaps the location of the mythical El Dorado (city of gold) they were looking for. This resulted in several expeditions during which the first Jesuit Missionaries settled in the Amazon Basin. This was the start of several Missions in which the local native habitants were obliged to settle and be converted to Christianity. This is also how Iquitos was founded. Located close to the confluence of the Marañon, Napo and Amazon Rivers Iquitos rapidly started growing but it was not till the beginning of the 1900’s that Iquitos knew its big boom. This big boom was triggered by the increased demand for rubber a resource found in the many rubber trees of the Amazon. Plantations of rubber trees were planted and it was till the 1920’s that Iquitos knew a time of great wealth and importance. From this moment on the Asian rubber plantations (created with seeds smuggled from Iquitos) were able to produce cheaper and therefore signing the end of the rubber boom for Iquitos. Nevertheless Iquitos was able to maintain its position as an important trading port in the Amazon basin. It exploited its timber, oil and mineral resources for export and processing, along with agricultural and other products. 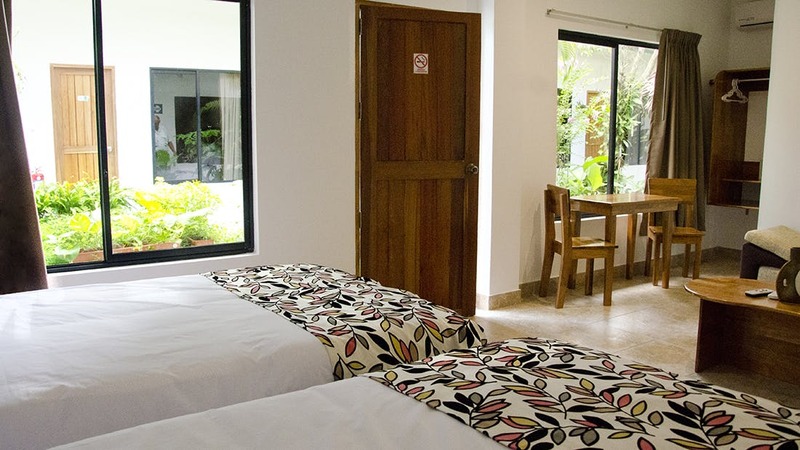 Nowadays tourism is also a large source of income for Iquitos but often threatened by the industries mentioned above. The Amazon River is the largest river in the world in terms of discharge of water and the second largest in length. The river originates in the Arequipa region of south Peru and crosses the Andes before dropping to the Amazon Basin. 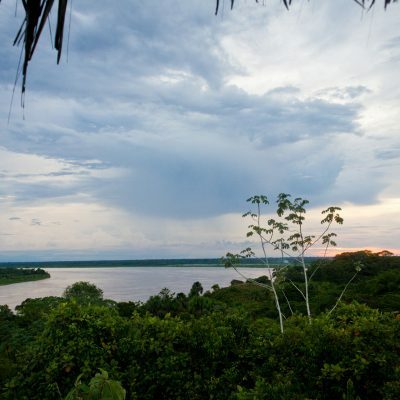 In Peru the main part of the river is called Marañon River and changes names in Nauta at about 100km from Iquitos. 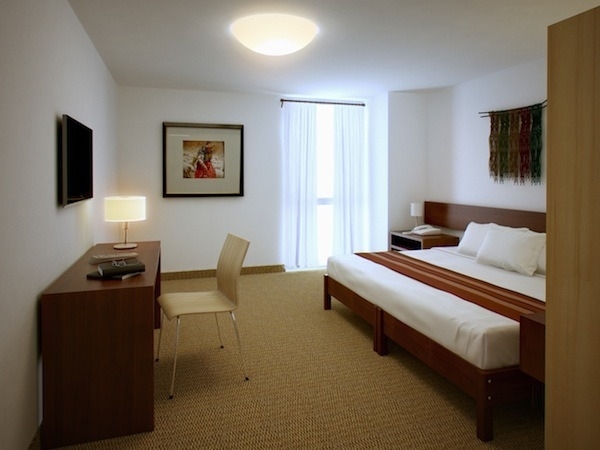 Iquitos is located on the left bank of the Amazon River and has the largest river port in Peru. For many first time visitors the size of some boats traveling the Amazon River is quite impressive. Located on some large plains in the depths of the Rainforest Iquitos is the largest city in the world that can only be reached by air or water. There are no roads leading to Iquitos and apart from the urban roads in the city itself there is only one other road leading to the port of Nauta about 100km from Iquitos and this is literally “the end of the road”. With almost one million inhabitants logistics is quite the challenge for this city with everything having to be airlifted or send in cargo boats. 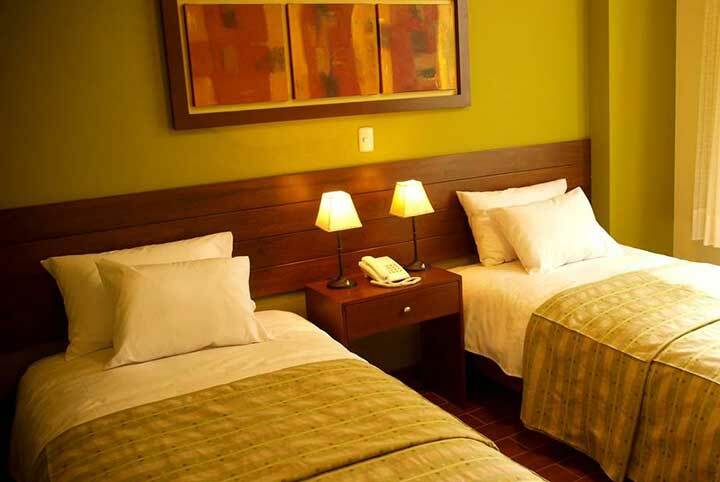 The city is divided into three parts with Iquitos Downtown and Belen being the best known and important ones. During the rainy season parts of Iquitos can flood, especially the lower parts such as Belen, where the houses are actually foreseen for this yearly flood. Iquitos is probably one of the more fascinating jungle cities on the planet. Not only the effort it takes to get there but also the general atmosphere still feels a little like the day of the great explorers being the first foreigners to set foot in a place such as this. 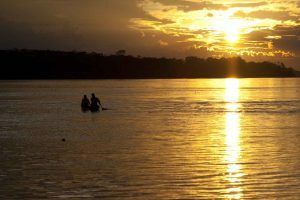 The city itself has a couple of worthwhile places to see but it is perhaps more the ambience and friendly outgoing people that makes Iquitos the destination it is. On the main square one can find the famous Iron House designed by Eiffel (the one from the tower in Paris) as well as the former Hotel Palace built in 1908. The Iquitos city center boardwalk next to the lowlands and river is a nice place to spend some time and perhaps try one of the typical juices or liquors from the region. Finally one also has to visit the floating market of Belen. This market is a fascinating spectacle on the senses and will give you an idea of everyday life in this unique city. The market in the dry season takes place mostly in the streets around the central market building of Belen but in the rainy season turns into an open air market spread out on bridges between pole houses, floating rafts and other types of boats. 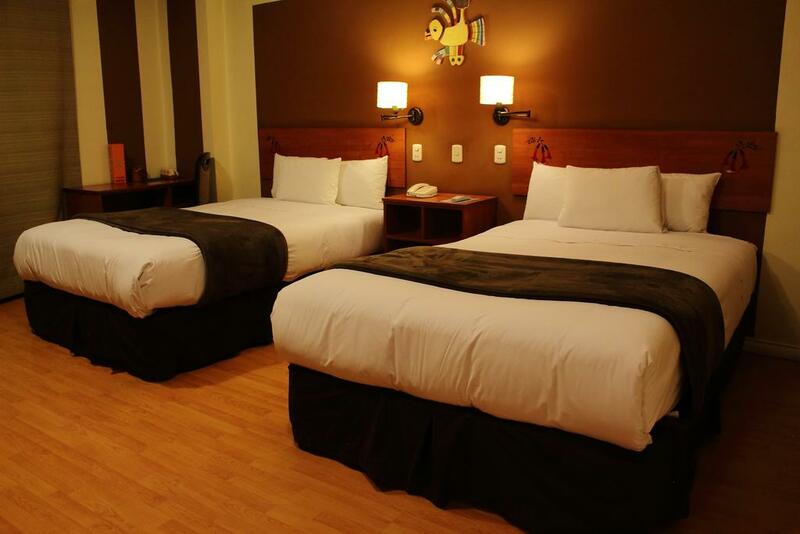 The main reason for most people to come to Iquitos is to visit the Amazon Rainforest and spot the wildlife here. 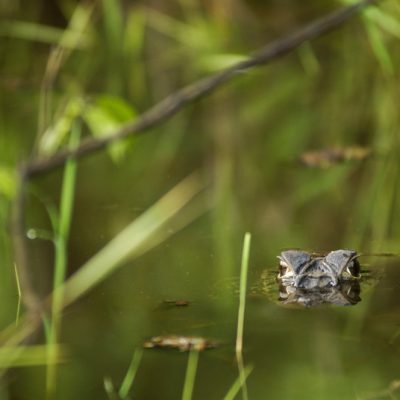 Birds, reptiles, small mammals, caimans and monkeys; in these forests you can find them all on one square mile. Being such a large city, to get to the depths of the Rainforest one has to travel in boat for a couple of hours. 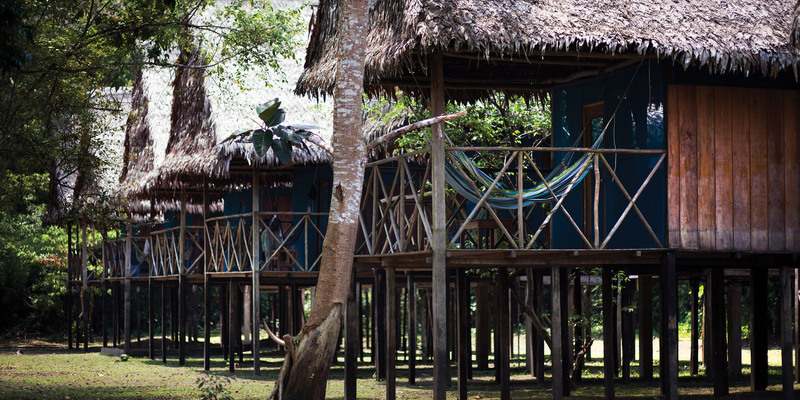 Around Iquitos there are a lot of lodges all having their own tourism concession and protected area. 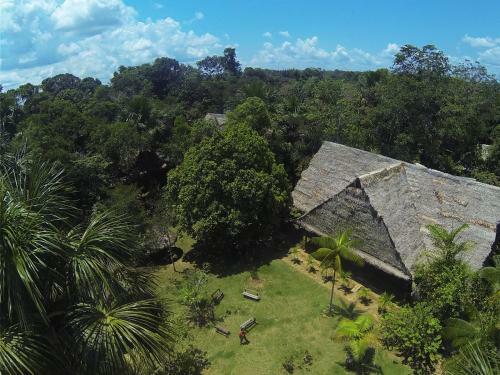 The biggest national park in the region is the Pacaya Samiria Park. 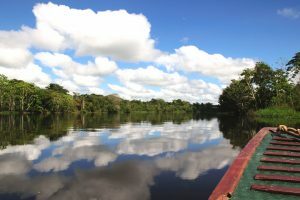 The jungle can best be visited with one of the many multi-day jungle cruises over the Amazon River or by staying at one of the lodges around Iquitos. 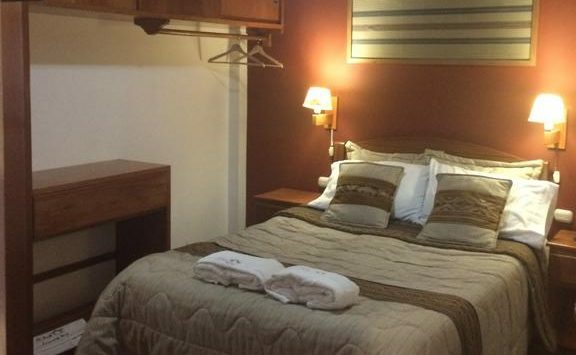 Closer to Iquitos there are also some small lodges but wildlife viewing here is limited. 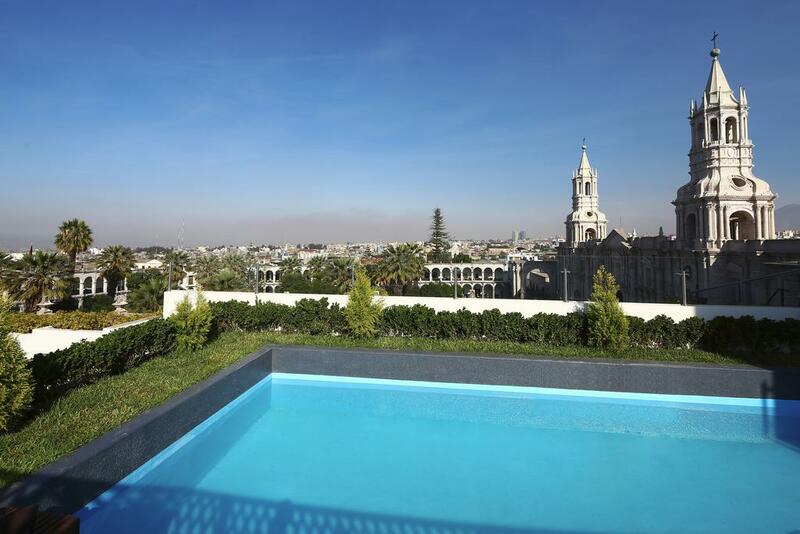 Arequipa is Peru’s second city in terms of population and economical influence and one feels the pride of its inhabitants. 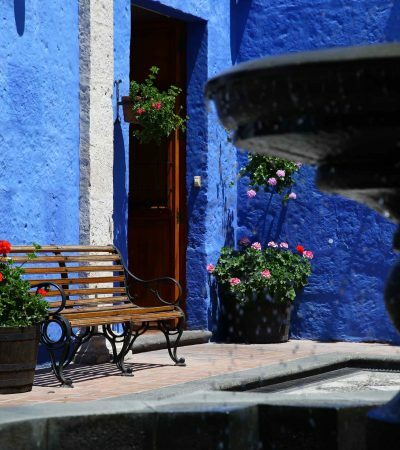 The city can look back on a rich colonial history during which the Spaniards made Arequipa one of the most important religious and economic cities of the country. This resulted in some failed attempts to gain independence from Peru but nowadays the modern Arequipeño decided to focus on what binds them rather what divides them; their love for food and the typical Andean Culture. 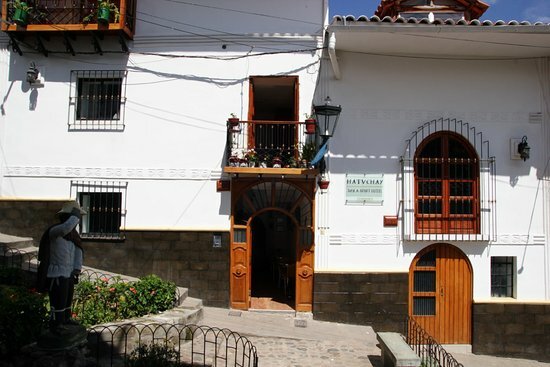 The city of Arequipa has several highlights but the Monastery of Santa Catalina will always appear in the top 5 as well as the Museum of Juanita, a child mummy found in the region. 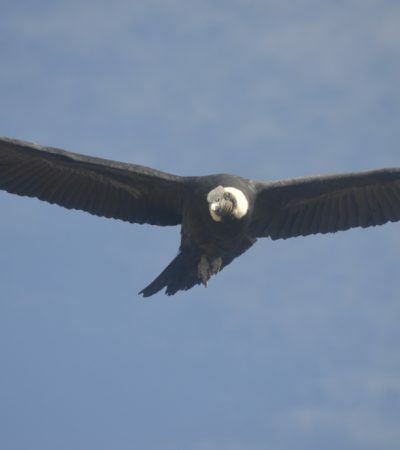 The Colca Canyon cannot be missed when visiting Arequipa as this will allow you a new look on the Andean life and culture as well provide you with the opportunity to see several active volcanoes and the flight of the mighty Andean Condor through the blue skies of the canyon. 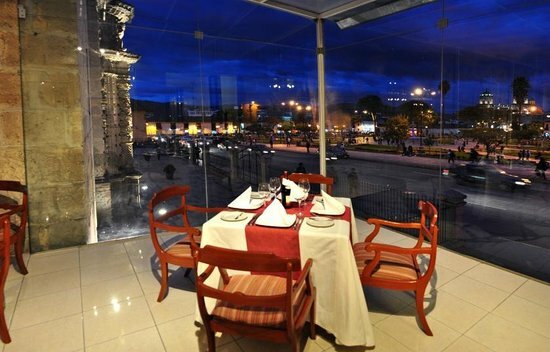 Arequipa is also a center of gastronomy as it is here that the sea and the Andes meet resulting in some typical dishes such as Chupe de camarones or Rocoto relleno. 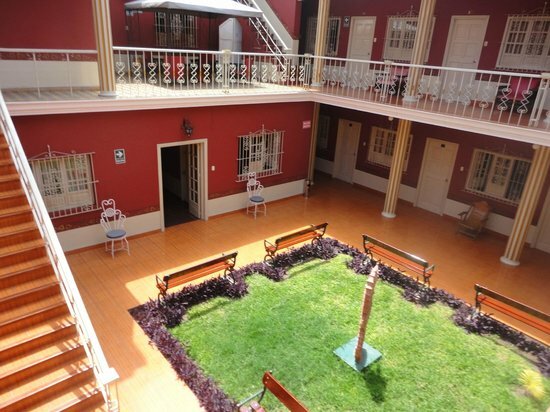 Finally Arequipa is a great base for those who love hiking, rafting and other outdoors activities. 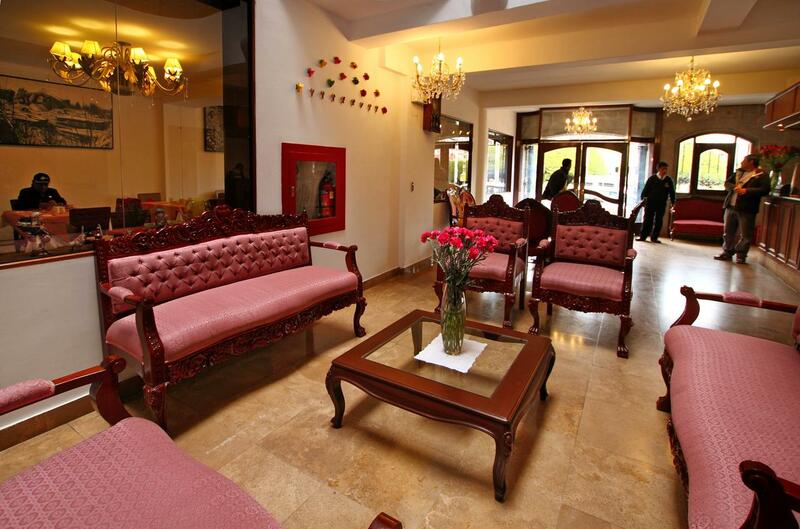 Following you can find some of our favorite Arequipa and Colca Canyon Hotels. This list is of course far from complete so let us know if you would be interested in other properties as well. Arequipa is Peru’s second biggest city in terms of population and economy and even the capital for some years after the independence. 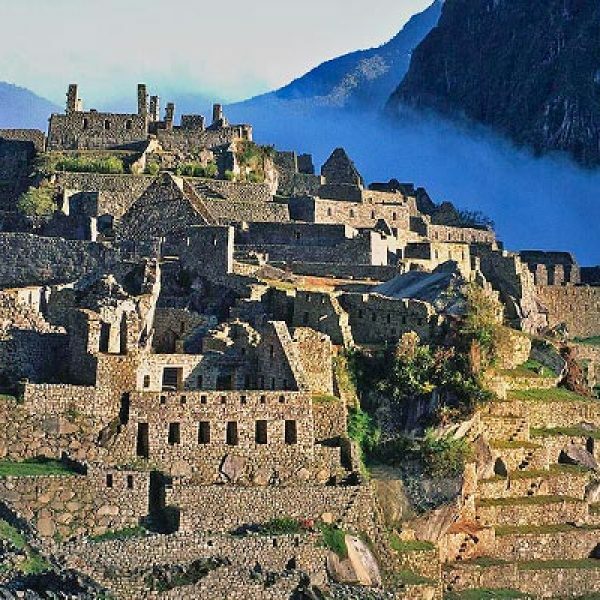 Little proof has been found in the region for organized cultures before the Spanish conquest but it is known that the Inca roamed this land as well as the some earlier inhabitants as can be derived from several pre Inca mummies found on mountaintops in the region. The Spanish founded the city in 1540AC and has always been known for its loyalty to the Spanish Crown. 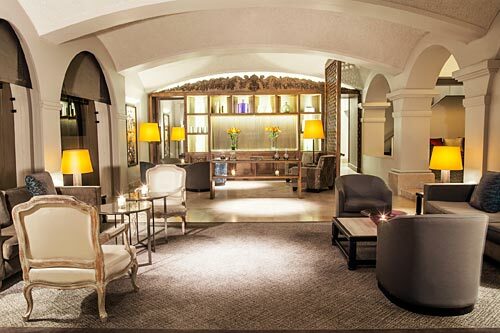 This resulted in special privileges under the Spanish rule. 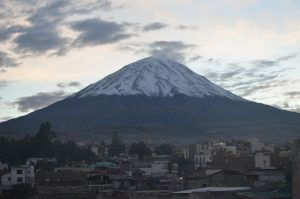 These privileges allowed Arequipa to become an economic heavyweight in Peru, a position they still hold these days. The city is nicknames “the White City” due to its city center almost completely constructed with Sillar, a white volcanic stone that is found in several quarries close to the city. The city is located at about 1,000km (622mi) South of Lima and about 100km (60mi) from the Pacific Ocean. 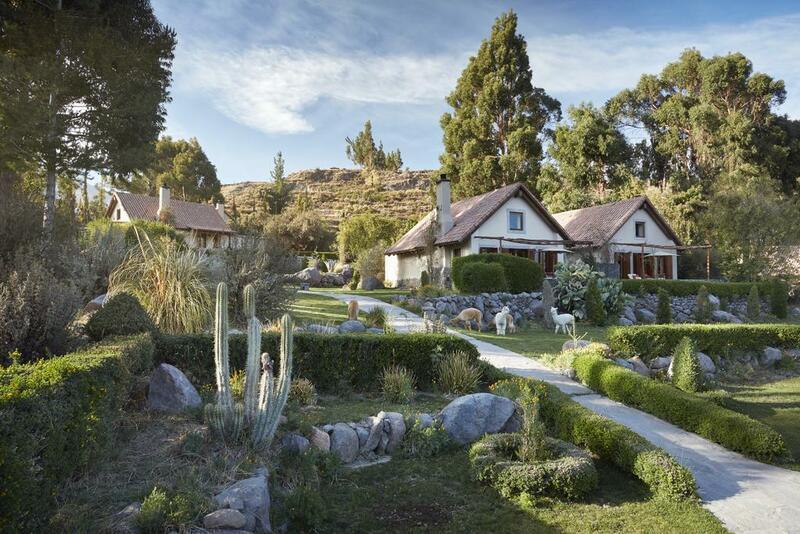 The city is located on an altitude of about 2,328m (7,638ft) above sea level on a highland pampa with on the West the road to the Pacific and on the East the first snowcapped mountains of the mighty Andes. The city skyline is characterized by the presence of three volcanic cones; the active Misti Volcano and the extinct Pichu Pichu and Chachani Volcanoes. 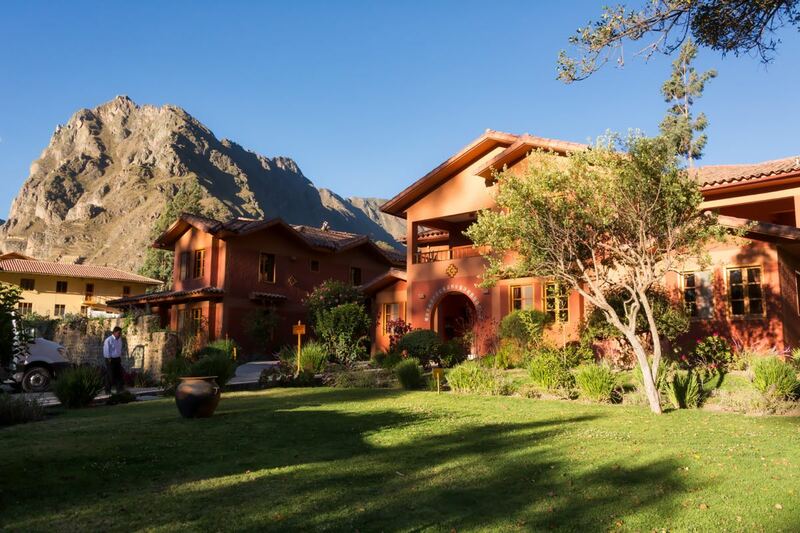 A couple of hours to the east you will find yourself in the heart of the Andes in the Colca or Cotahuasi Canyon surrounded by snowcapped peaks up to 6,000m (20,000ft). 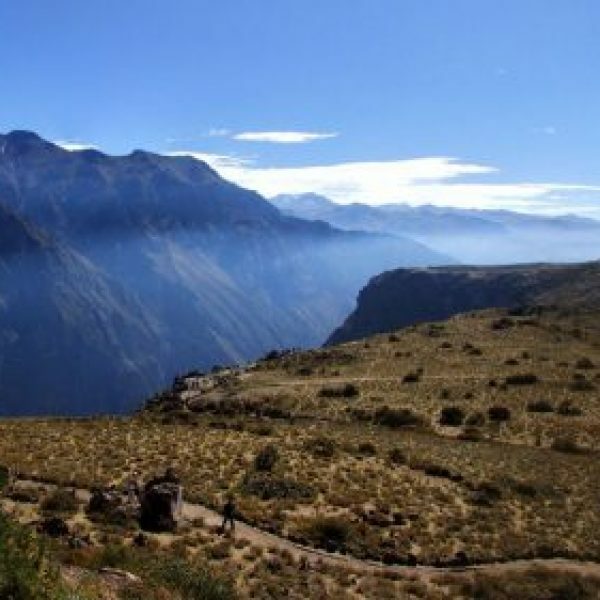 The Colca Canyon is the second and the Cotahuasi Canyon the deepest in the world with depths of around 3,000m (9,900ft). 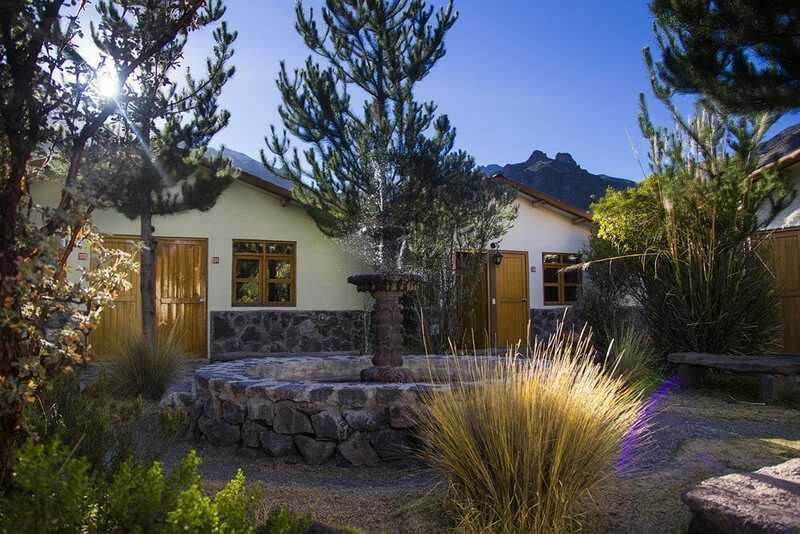 Both are excellent for hiking and outdoors activities even though the Colca Canyon is easier to reach and has more accommodation and other facilities. 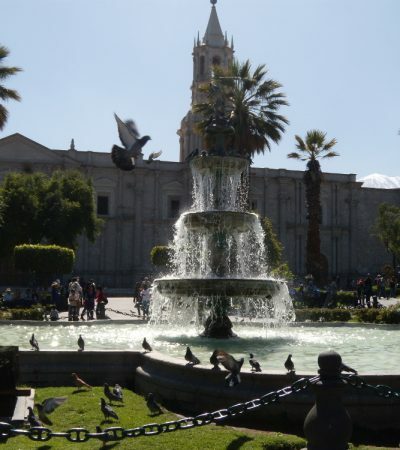 As any important city, Arequipa has quite some interesting places and sites to visit. 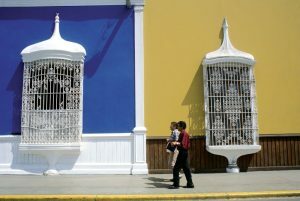 Most of these can be found in the immediate surroundings of the Plaza de Armas. 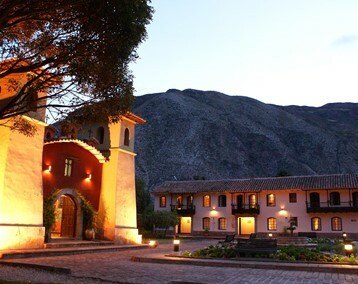 These are, apart from the Plaza itself -which according us is one of the nicest in Peru- the old Santa Catalina Monastery, the cathedral, the Iglesia de La Compania, the Museo Santuarios Andinos (Ica maiden Museum) and the Mirador de Yanahuara from where you can observe the city and its surroundings. Finally a visit to Arequipa is not complete without a visit to a typical picanteria (the regional restaurants) for lunch where you need to try the Chupe de Camarones, Rocoto Relleno or Queso Helado. 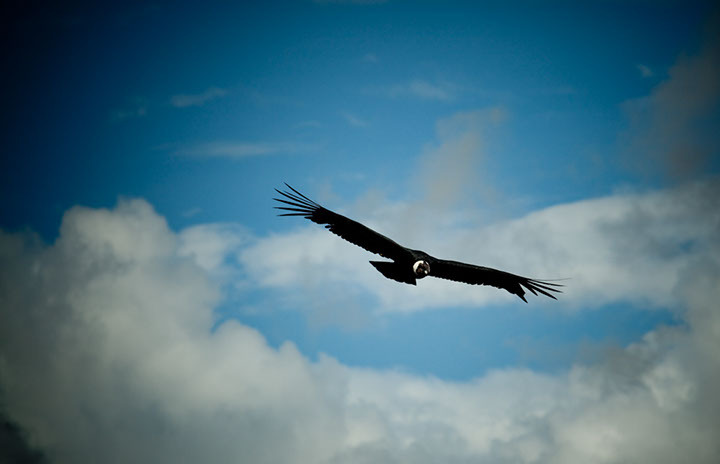 The Colca Canyon also has its fair share of sights to see with on top of the list the Cruz del Condor, the most famous place in the world to see the Andean Condor in its natural habitat soaring on the thermal winds that the canyon holds. 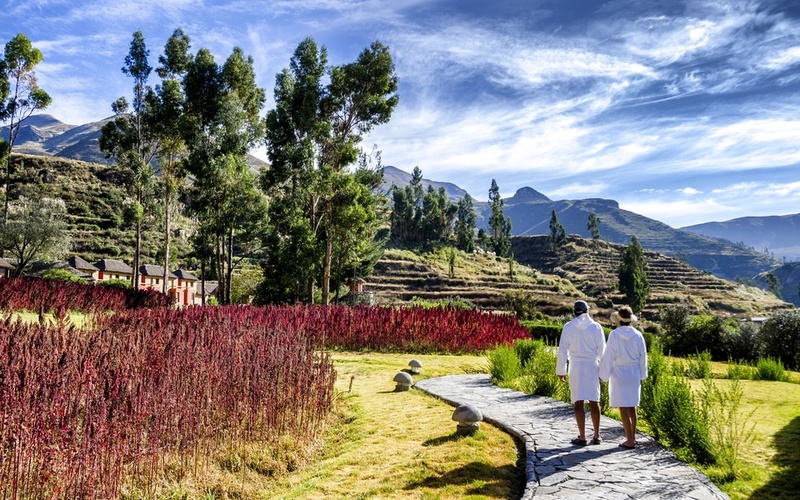 A visit to the Colca Canyon also goes hand in hand with a visit to one of the many thermal baths in the canyon which are known for their minerals, supposedly great for your skin. The Mirador de los Volcanes is another point that few people will forget as here you are at almost 5,000m above sea level and for many of us the highest they will ever get. 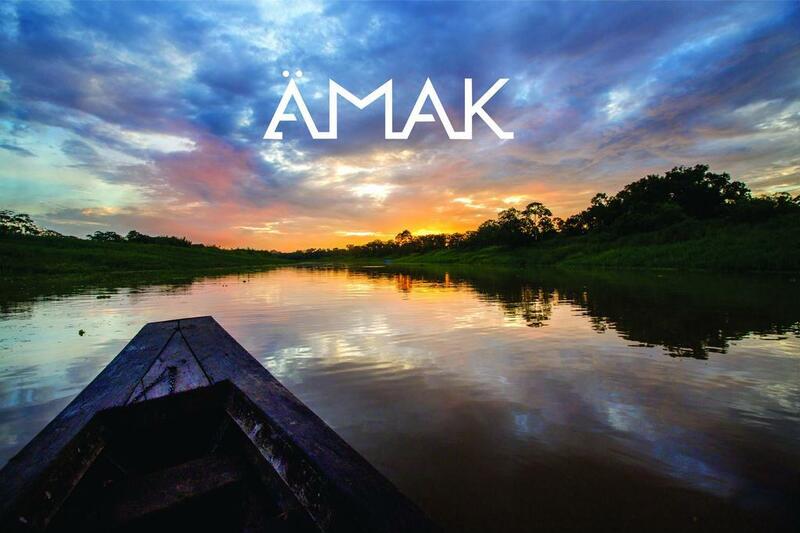 Two of Peru’s most famous Amazon Rainforest parks can be found in South Peru around the city of Puerto Maldonado. 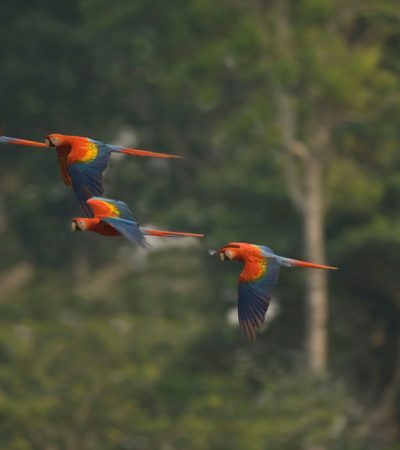 The Manu National Park is a more cloud forest park with altitudes around 400m (1,300ft) and the Tambopata National Park is in the low jungle on altitudes around 100m (300ft). 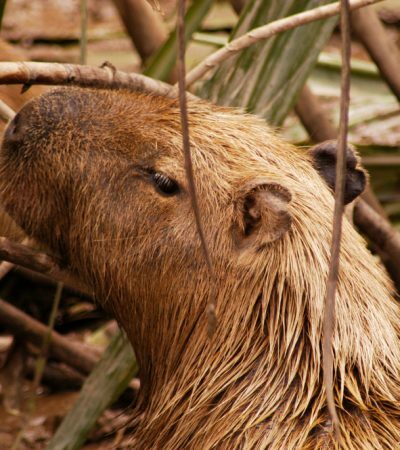 This results in different fauna and flora to be found in both parks with the Manu park very much known for its birds and reptiles meanwhile the Tambopata park is better known for its monkeys, giant otters and capybara’s. 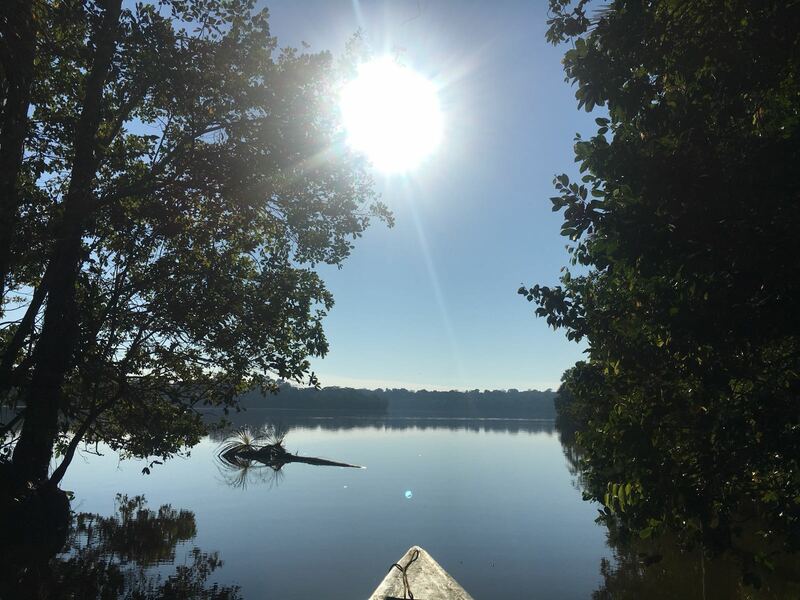 When it comes to accessibility the Tambopata national park is a lot easier to get to as it only requires a short to medium boat ride to get to most lodges. Manu National Park is still quite the undertaking to get to. There are no longer flights to a small airfield at the border of the park so one either has to travel overland from Cusco (about 8 hours during dry season) or fly to Puerto Maldonado and from here take a long boat journey to get to the entrance of the park. 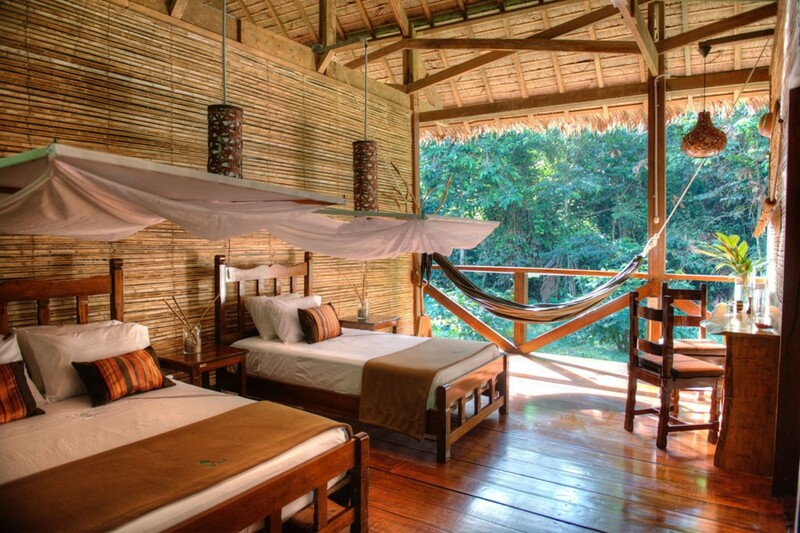 In any case whether it is Tambopata or Manu, both of these will allow you a unique glimpse on the life in the deep Amazon jungle. 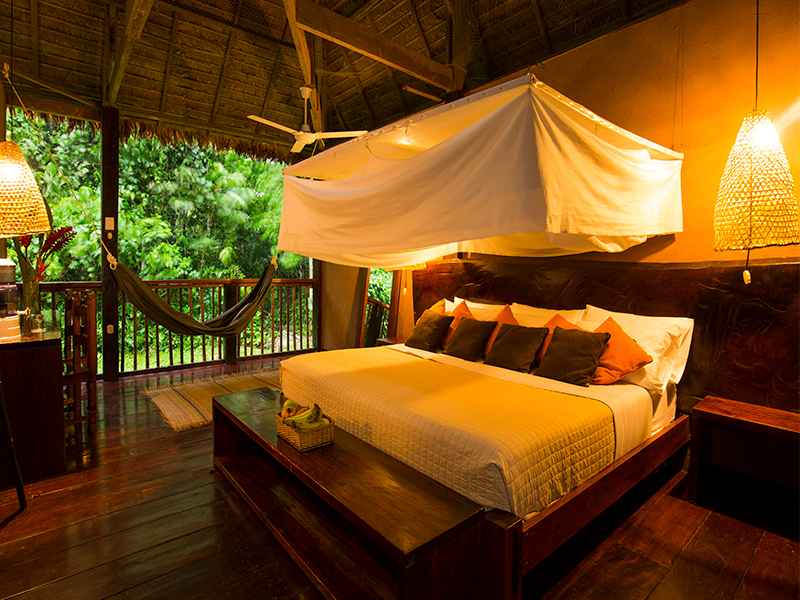 Following you can find some of our favorite Amazon Rainforest Lodges in the Tambopata & Manu National Parks. This list is of course far from complete so let us know if you would be interested in other properties as well. 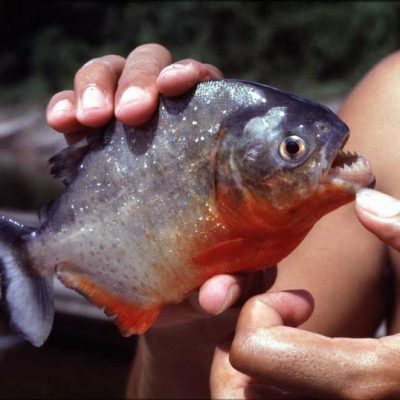 Unlike the Amazon Basin in north Peru, the Southern Peruvian Amazon were only explored many years later. As in North Peru the main catalyst for the exploration was the rubber boom of the early 1900’s. The city of Puerto Maldonado, the largest city in the Southern Peruvian Amazon was founded in 1902 on the confluence of the Madre de Dios and the Tambopata Rivers. 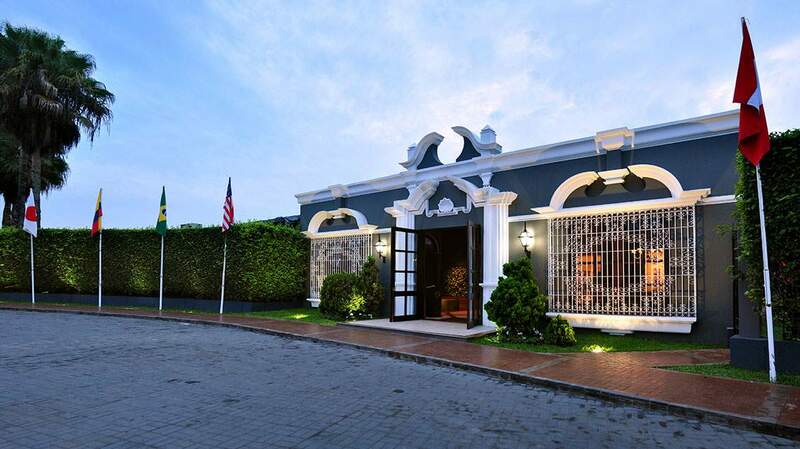 Nowadays Puerto Maldonado is still an important city in South Peru being the main gateway to the Tambopata and Manu National Park as well as producing oil, gold and exotic timber. These resources are also some of the region’s biggest problems and threats to nature. 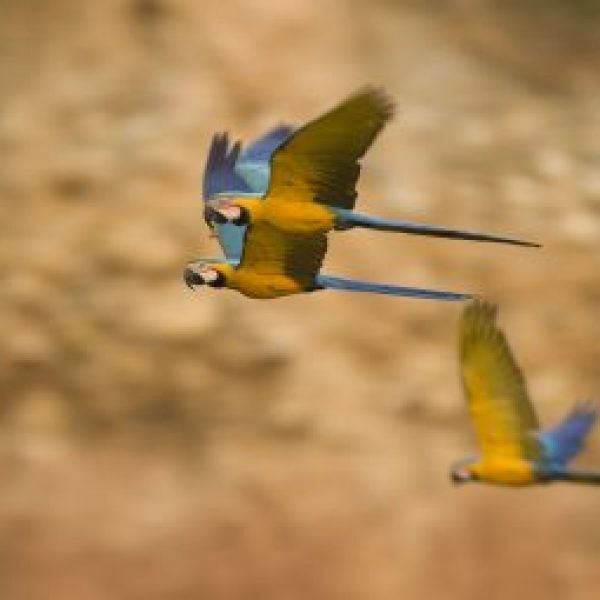 The rainfall in the Amazon region for instance is said to be decreasing due to indiscriminate deforestation by mining, oil production or logging. Each year, large areas of the forest are cut down increasing global warming pollution from the carbon dioxide and methane released due to the decaying and burning plants. Amazon rainforest is supposed to represent half the rainforests in the world today, so needless to say, it will be a great loss if we do not find a way to counteract this. 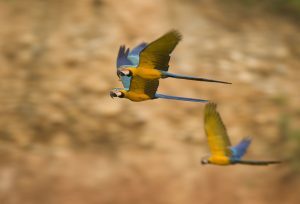 Peru holds South America’s second largest part of Amazon Rainforest (only surpassed by Brazil) and is the birthplace of the mighty Amazon River running from the Andes to the Atlantic Ocean. 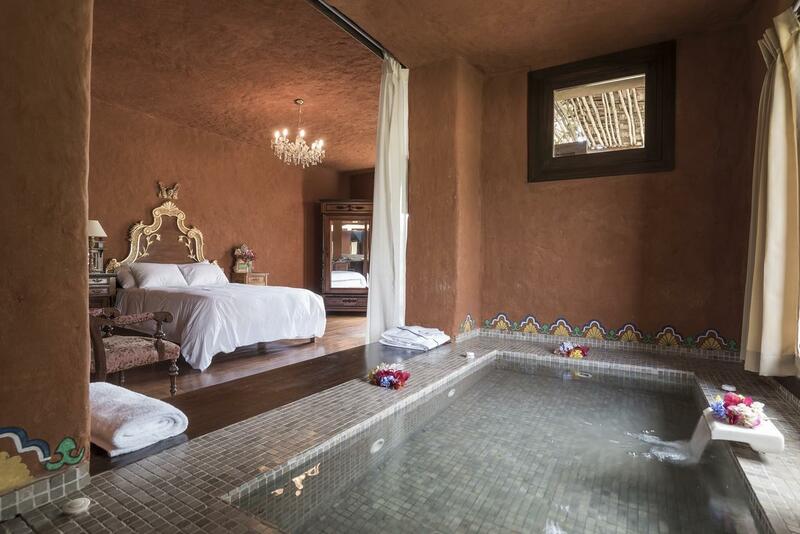 The river springs close to Arequipa and then crosses the Andes to reach the lowlands of the jungle from where it runs via Puerto Maldonado and Pucallpa to north Peru finally changing name to the Amazon River. The Amazon Rainforest almost counts for about 50% of Peruvian territory but only has about 10% of the population. 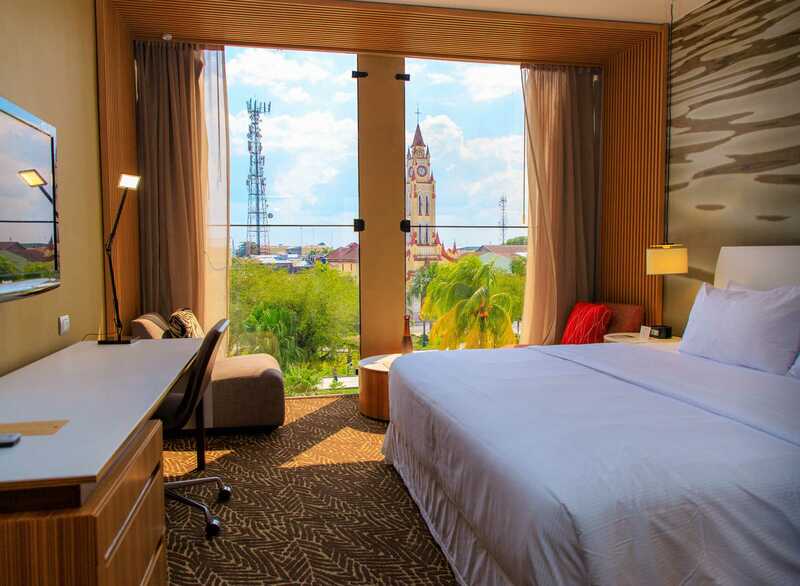 Iquitos is the largest jungle city in Peru followed by Pucallpa and Puerto Maldonado. 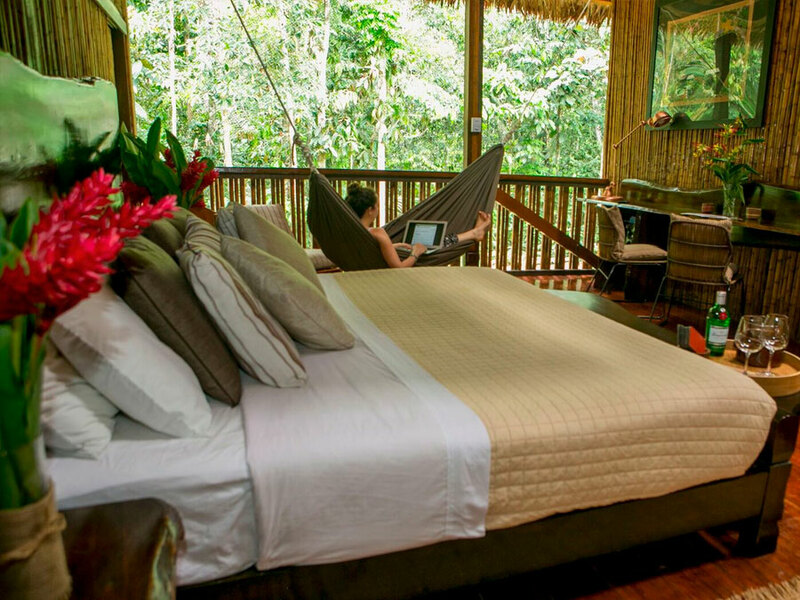 The altitude in the jungle differs more than most people think with the cloud forest altitude border at about 2,500 meters (8,200ft) above sea level and the low jungle running to almost 0m (0ft). 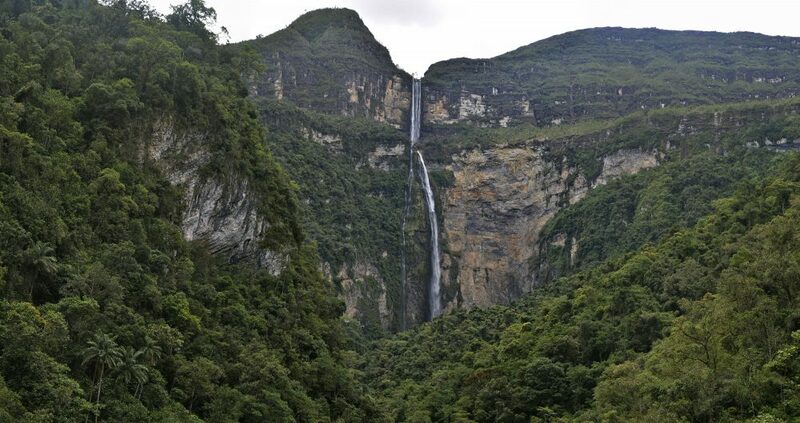 Through these altitudes the landscape changes drastically with sheer and steep lush green peaks in the higher parts of the jungle and large flat dense jungle parts only crossed by rivers in the lower parts. Fauna and flora is also for a large part organized around these altitudes as well as the types of forests that appear on each altitude. 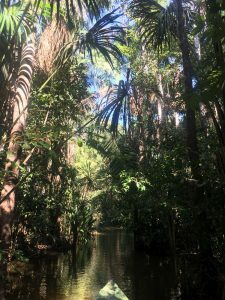 The Amazon rainforest climate in general is hot and humid. 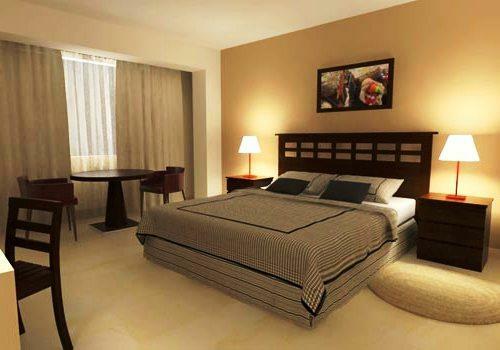 Temperatures are around 28°C (82ºF) during the day throughout the year which gets compounded due to the high humidity. There aren’t too many seasonal changes but rain can be more present during the rainy season. Due to the large river basin and the tropical heat, the moist air near the ground is heated, causing it to rise. When it reaches the condensation point, it forms rain clouds. This process happens the whole year. This type of rainfall is called convectional rainfall and the reason it can rain on any day during the year in the Amazon forest. 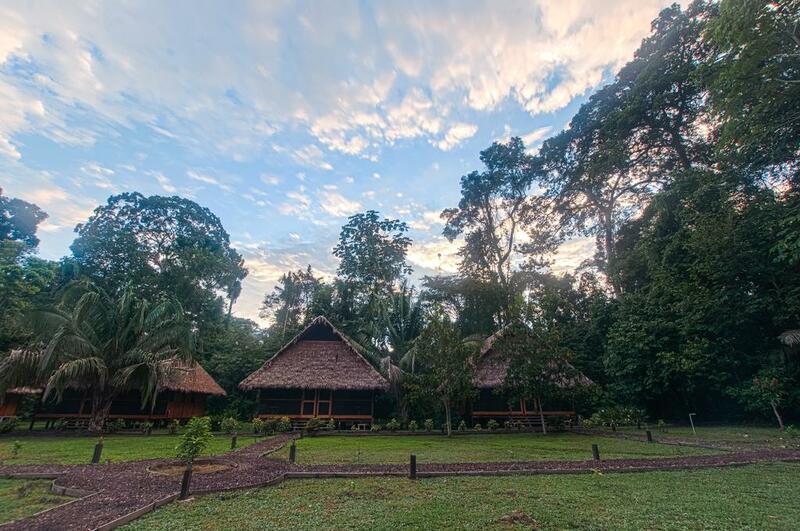 Such a massive destination in Peru it is obvious there is plenty to see and do in the Peruvian Amazon Rainforest. 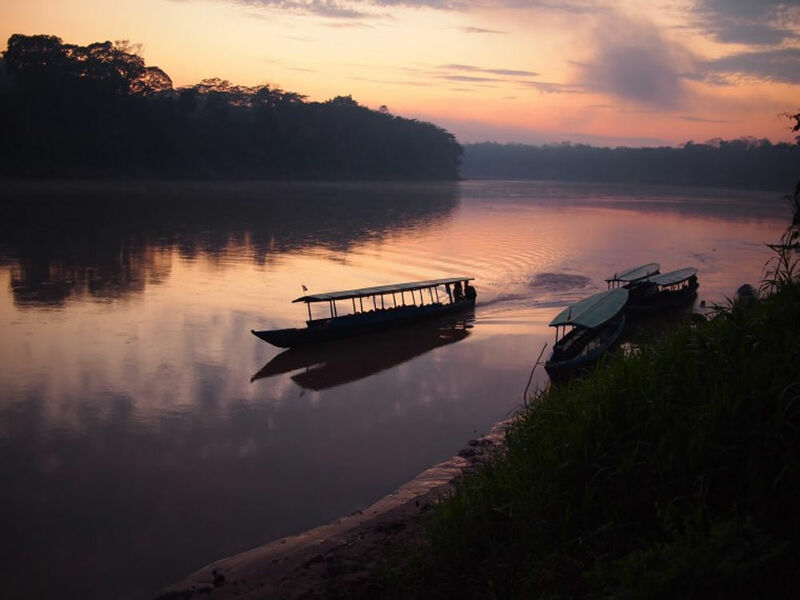 Nevertheless no visit to the Amazon is complete without having done; a boat ride on a true jungle river, hike through the dense forest in day and night time, climb a canopy tower or walkway through the treetops, spot wildlife on the banks of lakes and rivers from a canoe and spend the night listening to the amazing sounds of nature. The main animals visitors get in front of their lens here are caimans, monkeys, sloths, capybaras, giant river otters, macaws, spiders, snakes as well as dozens of different bird species. Lake Titicaca is a popular destination in Peru and with reason. The strong sun reflecting in the deep blue color of the lake, surrounded by snowcapped mountains provide first time visitors with a true breathtaking experience few other places provide. 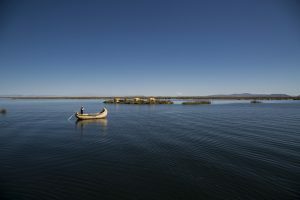 Visiting the lake by boat, cruising to the floating islands of Uros or the natural islands of Taquile or Amantani is an amazing excursion and will allow you to fully grasp the beauty of this lake. 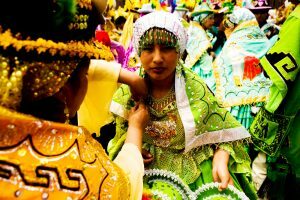 The strong local identity also makes that this is a region is culturally interesting with a lot of local festivities, the Virgen de la Candelaria Carnival being the best known one. 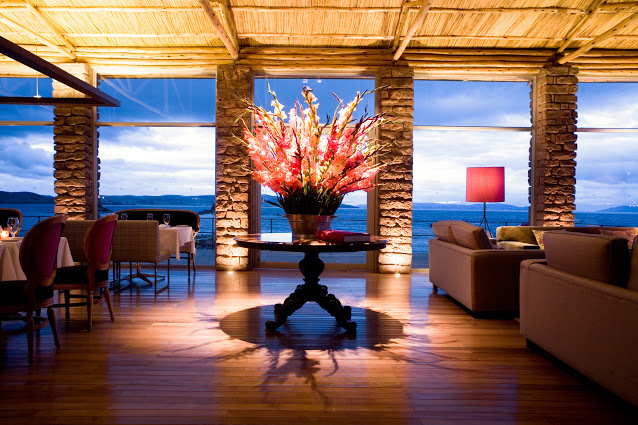 Following you can find some of our favorite Lake Titicaca Hotels. This list is of course far from complete so let us know if you would be interested in other properties as well. Traces of life around the lake go back for hundreds of years with the ruins of Tiwanaku on the Bolivian side of the lake probably being the best example of a pre-Inca society in the region. For the Incas the lake has a very symbolic importance as supposedly it was here that the first Inca king Manco Inca was born out of the sun and the moon on the Sun and Moon Islands on the Bolivian side of the lake. From here he marched to Cusco where he was told to found the capital of the Inca empire. What is known is that by the time the Spanish made it to Peru Lake Titicaca was Inca territory and that some local populations were actually driven away on floating islands to escape from the Inca. Due to its location the region has always been an important trade route as well as agricultural area. With an altitude of 3,811m (12,500ft) above sea level and a length of 190km miles (120mi) on a width of about 80km (50mi) – about the size of Croatia, the lake is not only one of the highest it is also the largest in South America. The maximum depth of the lake is about 300 meters but these is still some discussion about this as so far no expedition has reached the bottom of the lake. The lake has 27 rivers flowing into the lake but only 1 flowing out. The lake loses most of its water through evaporation. 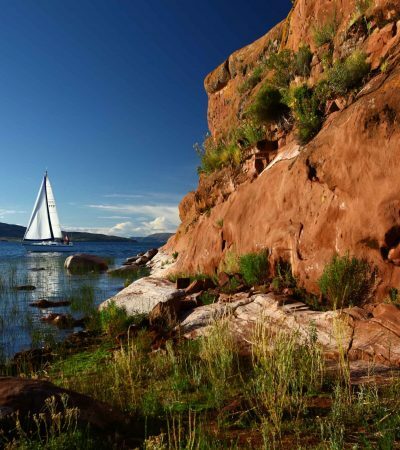 The massive body of water named Lake Titicaca is obviously the main attraction for people visiting the region but there are plenty of other things to see and do apart from visiting the largest lake in South America and supposedly the highest commercially navigable lake in the world. 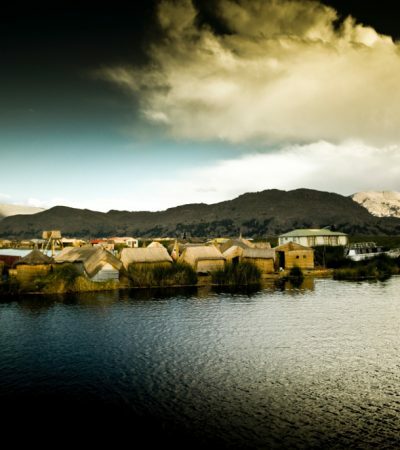 A visit to this high altitude lake surrounded by the Andes Mountains however, would not be complete without visiting curious Floating Islands of Uros. These Floating Islands are made out of Totora reed and the Uros people have been living on these for hundreds of years. The story goes that these people refused to live under Inca during the time of the Inca empire and therefore sought their refuge on the lake itself. 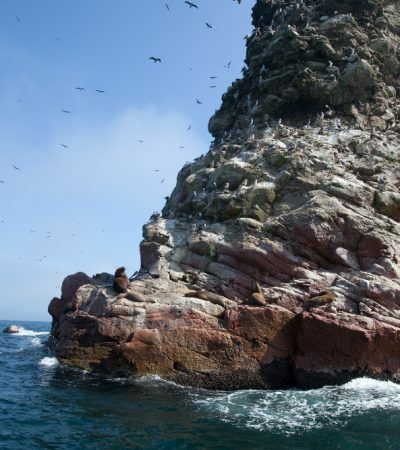 On the Peruvian side there are also two natural islands, both of which can be visited; Taquile Island and Amantani Island. Both of these have a distinct culture and the peace and quietness of the islands is something overwhelming. 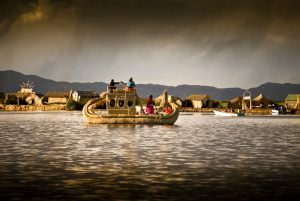 The floating islands of Uros are located at about 30 minutes in boat from Puno and Taquile at about 2 hours in boat. Amantani is the furthest out at about 2.5 hours in boat. 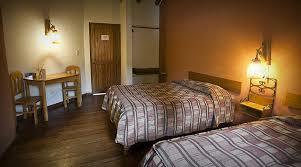 This is one of the reasons that most people visiting Amantani spend the night with a local family. At about 45 minutes from Puno we can also find the Sillustani Funerary Towers. This Pre Inca site is located next to a small lake close to Lake Titicaca and is made up out of dozens of small and larger funerary towers constructed with some perfectly carved stones. 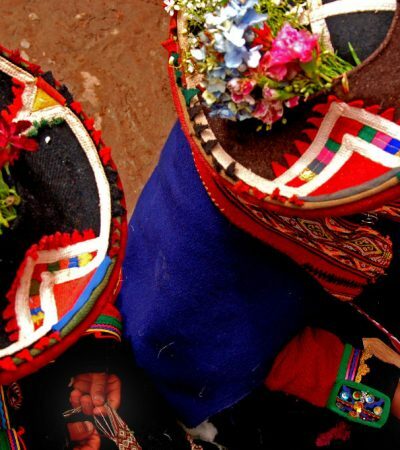 Another of Puno’s main attractions is the yearly Virgen de la Candelaria Carnival which takes place in the first week of February. 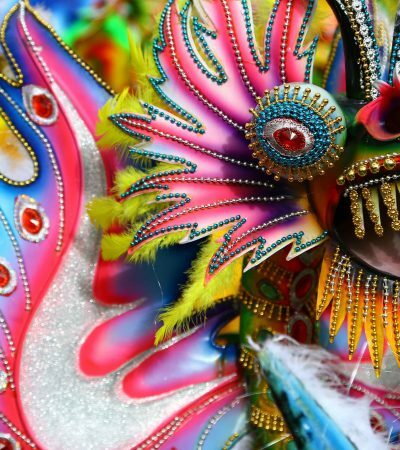 This carnival is one of the oldest on the continent and a week of typical dances, amazing costumes and the necessary Carnival madness. Finally Puno is also the gateway from Peru into Bolivia. 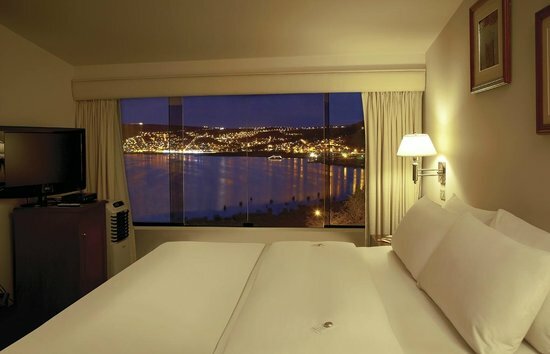 Copacabana on the Bolivian side of the lake as well as the Island of the Sun (Isla del Sol) and Island of the Moon (Isla de la Luna) are only a couple of hours away and even La Paz and Tiwanaku can be visited in one day from Puno. Nicknamed City of Kings as it was the first capital of the Spanish Viceroyalty in South America. 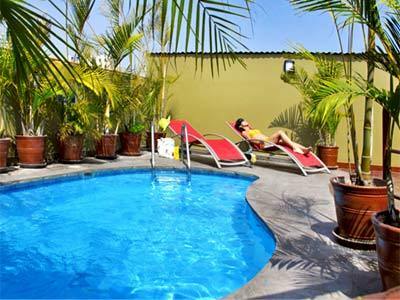 Lima is the proud capital of Peru and home to about 10 million Limeños living, spread over 30 districts or barrios. The city was relatively small till the seventies and eighties when under influence of the local terrorism in the provinces Lima started growing rapidly and with little urban planning. Nowadays Lima is an urban jungle where in the course of several blocks one can find newly built high rise buildings next to colonial houses and a shantytowns on the other side. 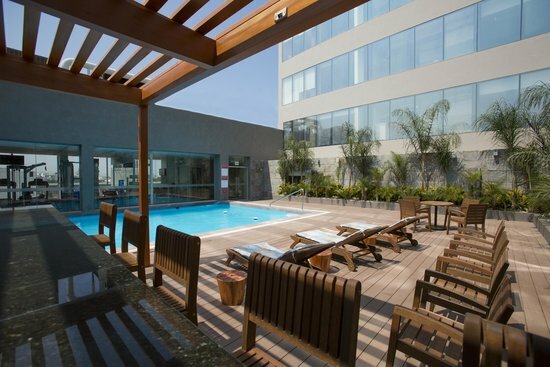 This eclectic “sense” of architecture and ambience for a part creates Lima’s unique feel. 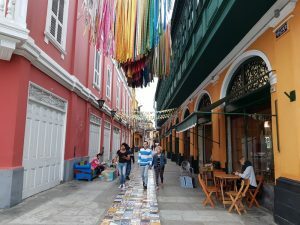 Lima however is a clear example of a city that is not only discovered with your eyes and ears but also and perhaps even more, with your smell and taste. The only city on the continent with more than 5 restaurants among the world’s best’ as well as unique “whole in the wall” eateries on every street corner. 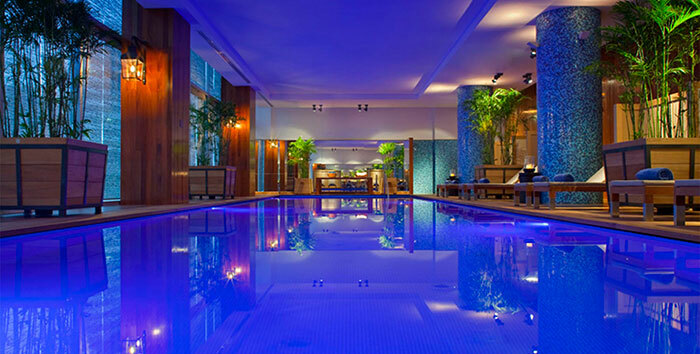 Lima is a city that will fascinate even the most experienced foodies in town. 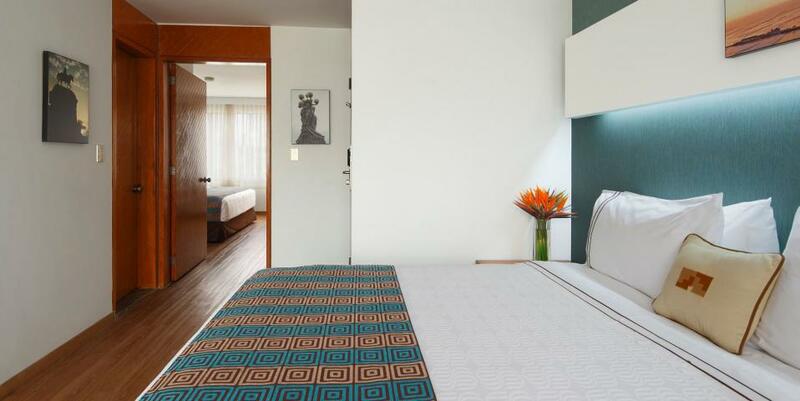 Following you can find some of our favorite Lima Hotels. This list is of course far from complete so let us know if you would be interested in other properties as well. Lima was founded on January 18, 1935 by Francisco Pizarro under the name “City of Kings” and named capital of the Viceroyalty of Peru, the biggest and most important city on the continent at the time. Originally spreading over the Chillon, Rimac and Lurin Valley, the city started spreading and did not stop till the day of today. Proof of life in the region dates back to about 2,500BC with dozens of Huacas (ancient funerary temples) found in and around the city. Several of these such as the Huaca Puccllana or the Huaca Huantille can be visited these days. 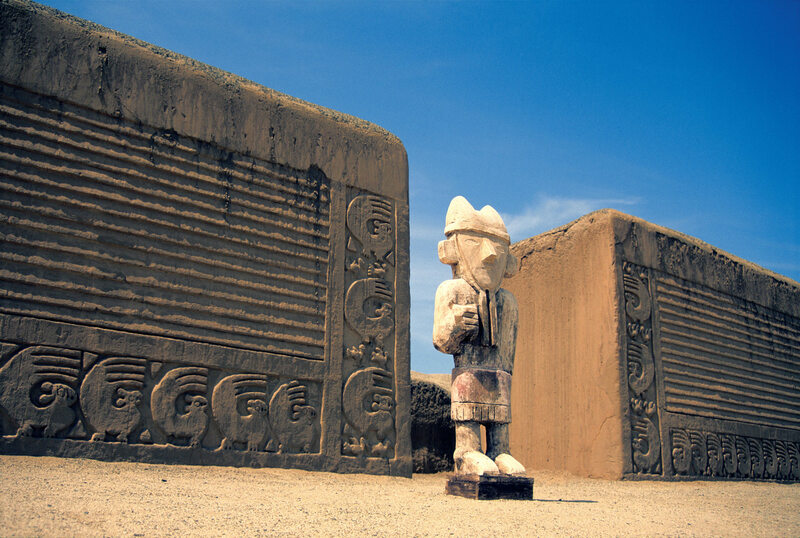 Inca ruins can also be found with the site of Pachacamac in the South of Lima. In Colonial days the city thrived on the gold and silver passing through en route to Spain as well as the preferential status the territory and its rulers had obtained from the Spanish Crown. After the struggle for independence Lima became the scene of many internal and international disputes as well as saw the formation of Peru as a country from close by. Nowadays the city is one of the regional giants with a population of about 10 million and an economic, political and cultural heavyweight. 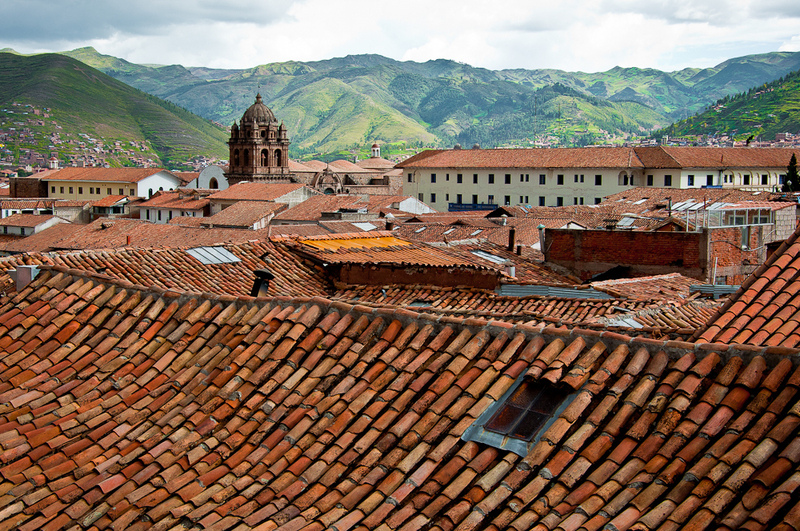 The city originated in the Rimac Valley coming from the Andes and running to the Pacific Ocean. 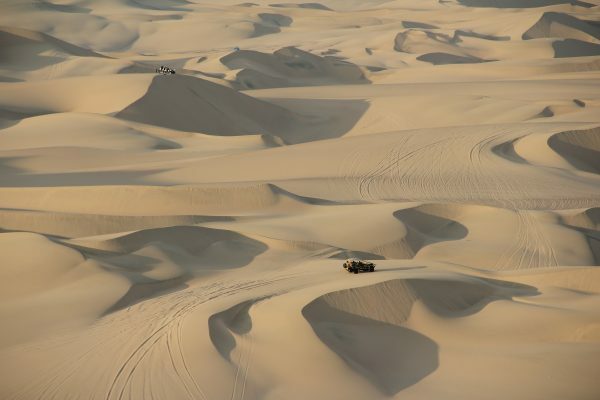 Located in the desert, Lima is the second biggest desert city in the world after Cairo and for the most part flat. Due to the growth nowadays the start of the Andes Mountains have been incorporated in the city. These are often so-called Pueblos Jovenes (local favelas) where running water and electricity is not necessarily present. The city is made up out of 30 districts the largest (San Juan de Lurigancho) with more than 1.5 million people and the smallest (Barranco) with several thousands. 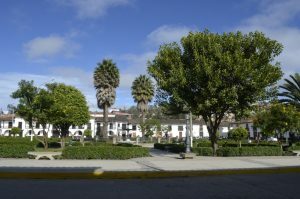 The colonial city center as well as most historical barrios are located next to the Rimac River about 3km (1.5mi) inland. 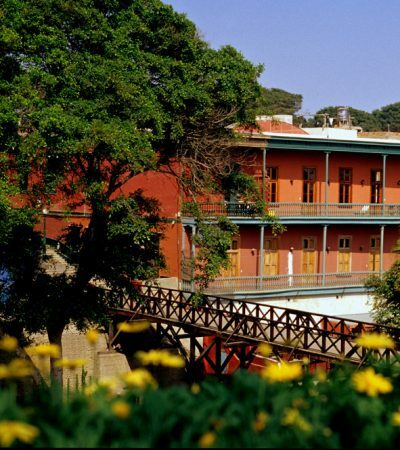 The popular tourist districts Miraflores and Barranco used to be the seaside retreats of the wealthier Limeños but since the seventies also incorporated in the city. 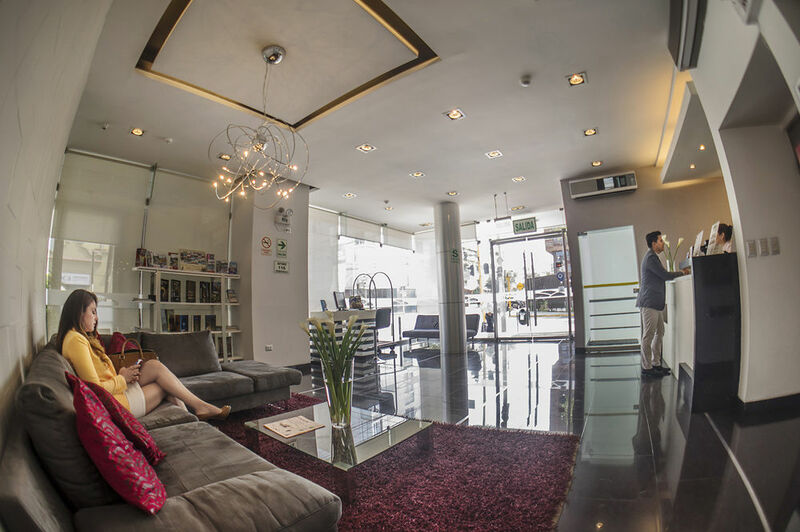 San Isidro is the financial heart of the city and thus Peru and home to most high rises and service industries. 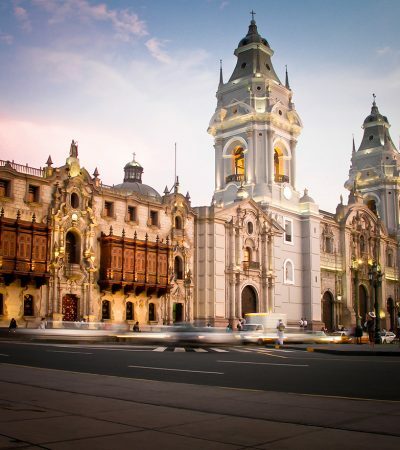 As you can imagine for a city of its size, Lima has plenty to see and do but more than with any other city on the continent what matters in Lima most is the food. 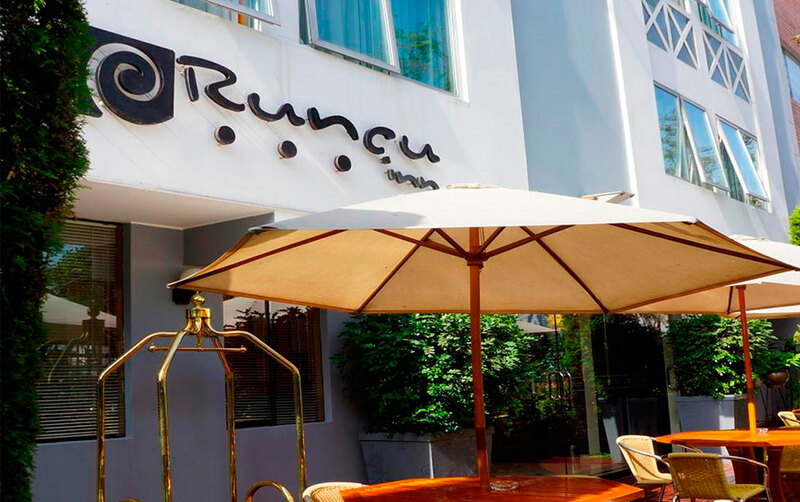 The hardest tables to land in town are of course those of the worldwide renowned chefs such as Central from Virgilio Martinez, Maido from Mitsuharu ‘Micha’ Tsumura or Astrid & Gaston from Gaston Acurio. These are closely followed by the names of Rafael, El Marcado, Isolina and Toshi. But Lima would not have its gastronomic revolution if it weren’t for the small “Hole in the Wall” eateries that created this national buzz that became an international sensation. Small places with local dishes such as ceviche, lomo saltado, arroz con pollo and chicharrones are often the true culinary jewels in Lima. 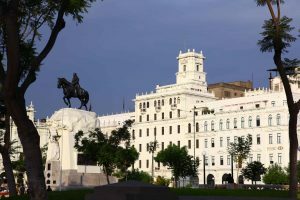 When it comes to touring the city; first of all the historic city center cannot be missed with its beautiful San Martin Square as well as the Plaza de Armas with the Presidential palace and cathedral. Also worth the visit is the San Francisco Monastery and the close by China Town. 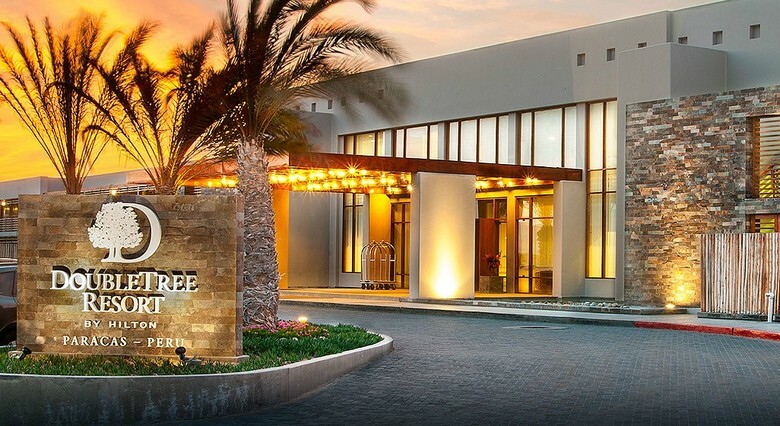 On the Ocean front Miraflores takes most attention with its large hotel offer, amazing restaurants and shopping opportunities. The other seaside district Barranco is somewhat more bohemian and moves a little slower than the rest of Lima. 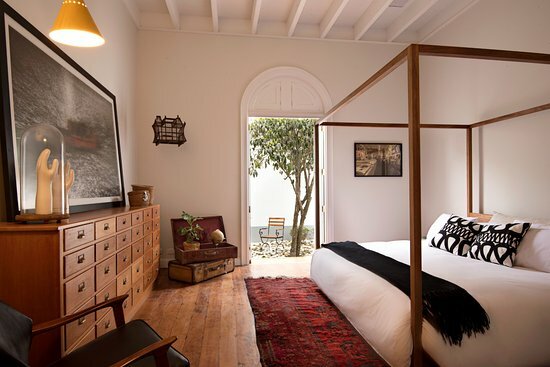 Dotted with art galleries, boutique hotels and small scale restaurants this is the place to be for those looking for romance. 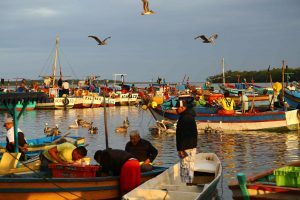 For those who are looking to see the rougher side of Lima, the old harbor area of Callao and La Punta are the places to be. This workers’ area has been off the radar for a long time but nowadays is enjoying a true cultural revolution with new art galleries, restaurants and other initiatives popping up on a daily basis. The Sacred Valley of the Incas or Valle Sagrado de los Incas in Spanish, was of undeniable importance to the Inca empire. 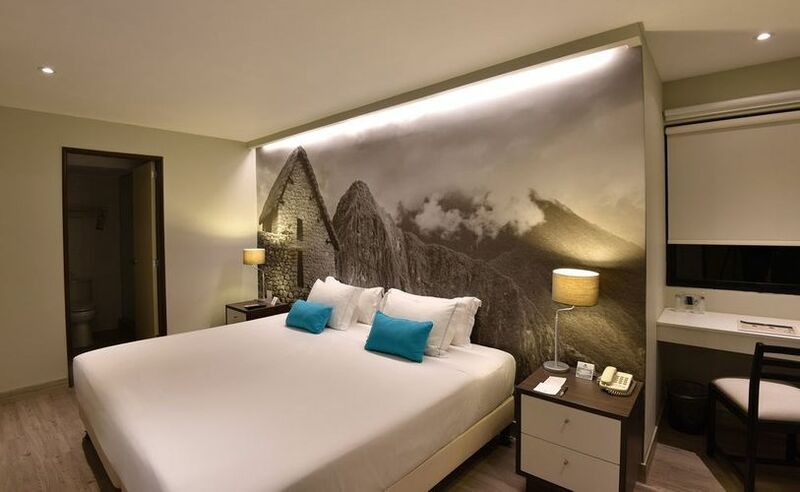 Located at about 1 hour drive from the city of Cusco, the valley is home to some important towns in Inca times such as Ollantaytambo and Chinchero. Blessed with very fertile lands of the Urubamba River and an excellent climate, the valley allowed the Inca to generate many of the agricultural innovations they became so known for. These lands were so important that on the beginning of the valley (Pisac) as well as the end (Ollantaytambo) large Inca Fortresses were built to protect the valley from strangers. 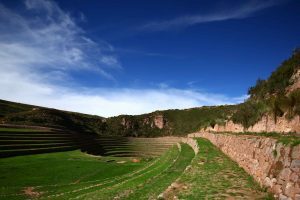 These two archaeological sites are still the two most important Inca ruins to visit in the Sacred Valley and make up for a great day in the Sacred Valley. 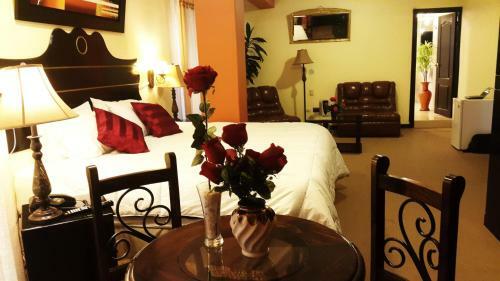 Between these two there are dozens of smaller Inca sites such as Huchuy Qosqo, Chinchero, the circles of Moray and the Salt Mines of Maras – allowing you to easily extend your Sacred Valley tour to two days. 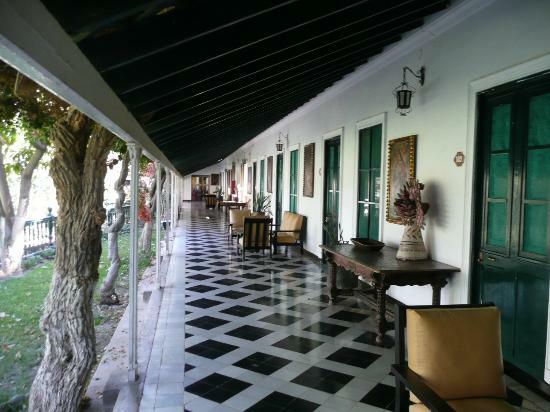 After the conquest, the Spanish who also appreciated the mild climate and lower altitude here, established dozens of colonial haciendas. 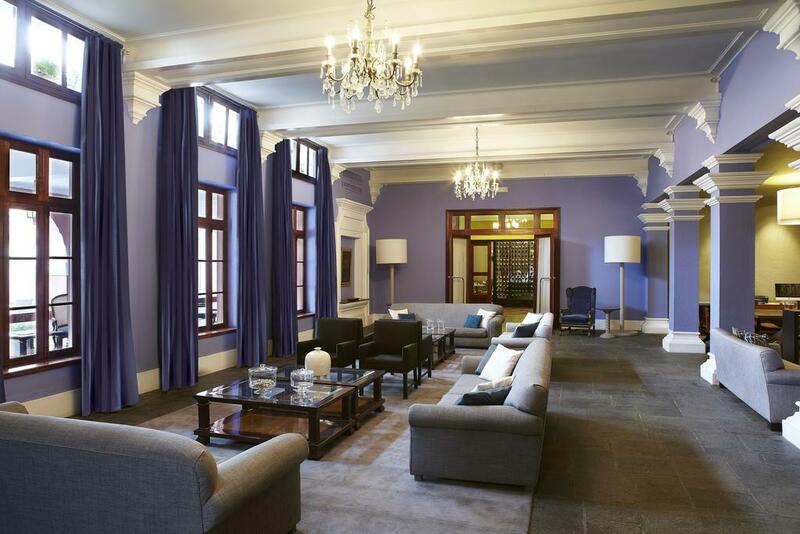 Several of these nowadays have been transformed into gourmet restaurants or amazing boutique hotels. Dotted with picturesque villages and drenched in the typical Andean culture, in the Sacred Valley you will also find some amazing local farmers and artisan markets that are more than worth the visit; Chinchero and Pisac market being most famous ones. 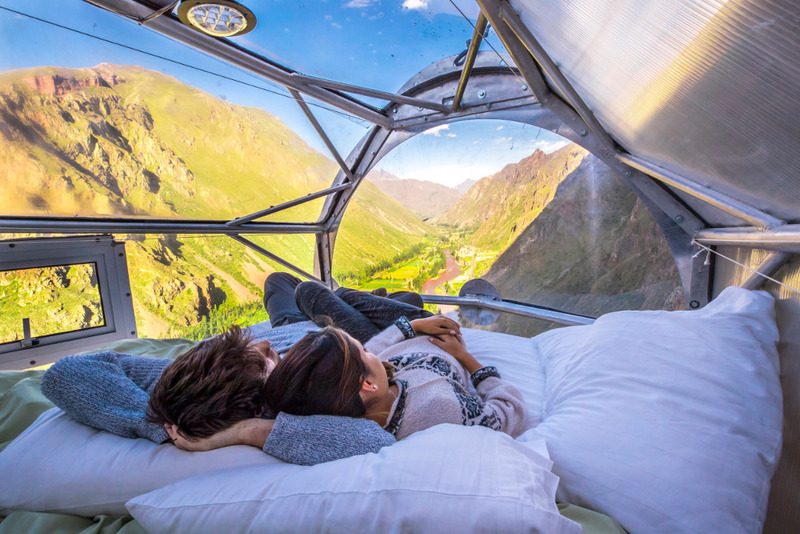 As you can read, the Sacred Valley is so much more than just a stop between Cusco and Machu Picchu – it is a destination on its own. 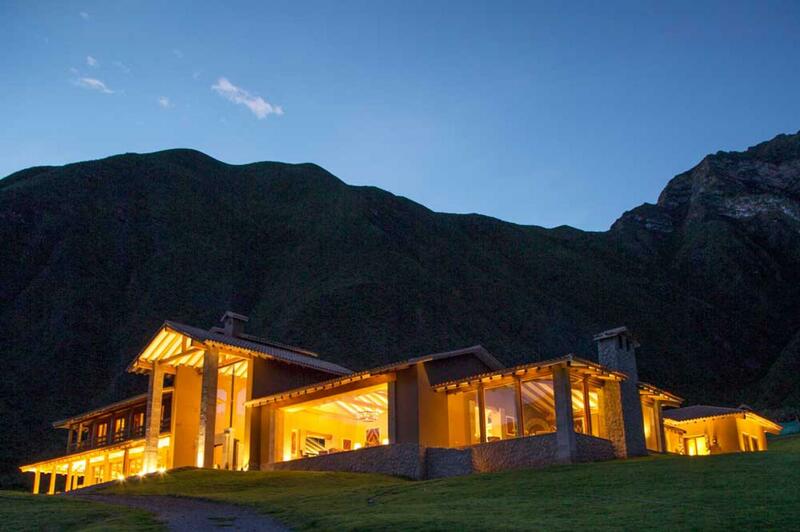 Following you can find some of our favorite Sacred Valley Hotels. This list is of course far from complete so let us know if you would be interested in other properties as well. The official name of the Sacred Valley is actually Urubamba or Vilcanota Valley, named after the river running through it. 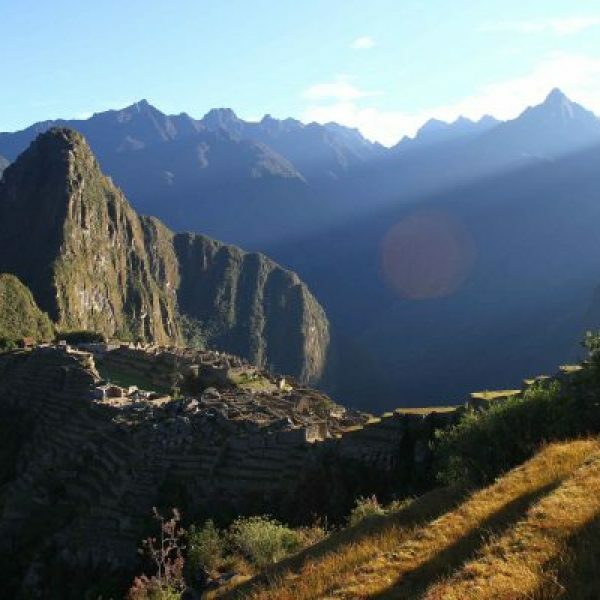 The name Sacred Valley was given by an Inca chronicler called Garcilazo de la Vega Inca referring to the importance of the valley for the Inca empire. Blessed with a fertile flood lands, good climate and on lower altitudes, the valley provided the ideal farming playground for the Incas. The valley became the epicenter of their agricultural production and place to elaborate new farming methods as well as architecture. The reason the Sacred Valley boasts several archaeological Inca sites of which Chinchero, Pisac and Ollantaytambo are the best known ones. 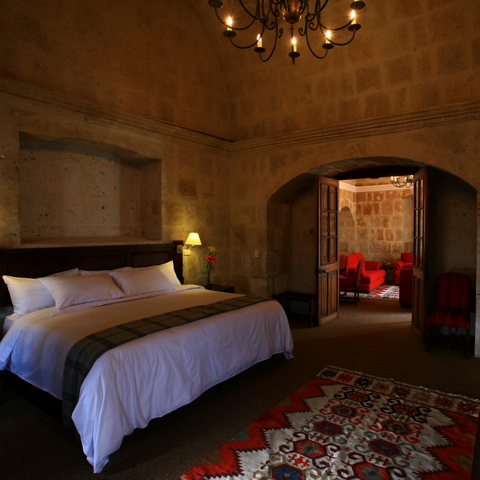 Smaller sites include the circular terraces of Moray, the salt mines of Maras and the royal retreat of Huchuy Qosqo. 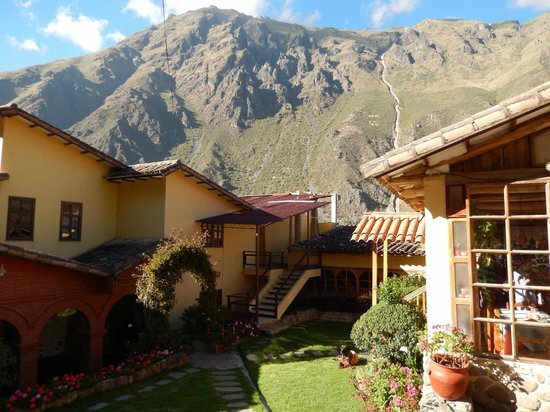 Pisac was constructed around 1440AD with military, religious, and agricultural structures making it possible that it was also a defense fortress for the southern part of this valley formed by the Urubamba River. 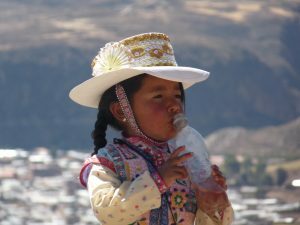 In the time of the Inca the town was probably named differently as the town of Pisac was not founded till the colonial times. The ruins of Ollantaytambo probably fulfilled the same purpose as the fortress of Pisac but on the opposite side of the valley. The construction of Ollantaytambo never was completed as the Spanish arrived in 1532AD when the site was in full construction. 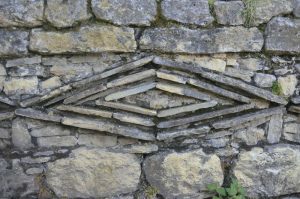 Proof of this can still be found by the ramp that still leads up to the western side of the ruins as well as the “sleeping stones” stones that were towed halfway but never put in place. The town of Ollantaytambo is quite unique as it is one of the few examples of original Inca Urban planning with the canals and the street plan still intact as well as many original Inca doorways. 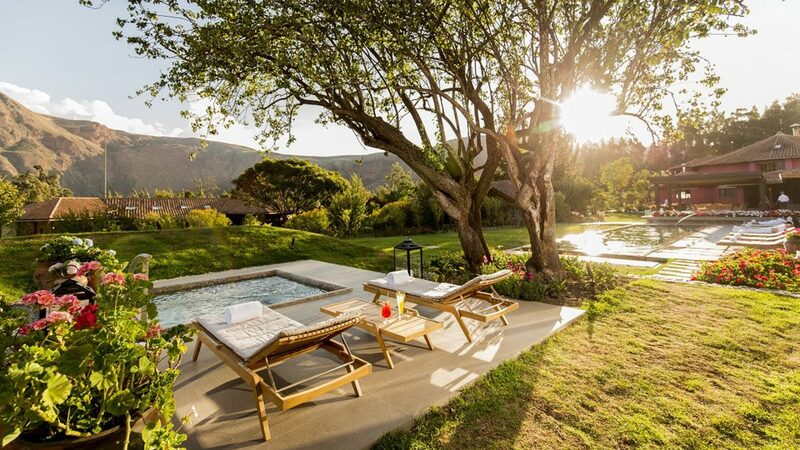 The beauty of this magical valley is that even though the century long Spanish occupation, the Sacred Valley and its people have managed to keep the direct links to their Inca heritage alive till the day of today. 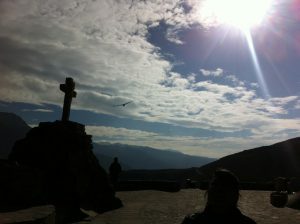 The Sacred Valley is located at about 35km (21mi) from the city of Cusco and can be accessed by two roads from Cusco. One to Pisac and one to Urubamba. 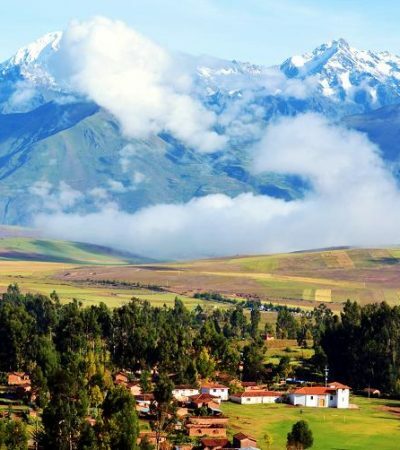 Between Cusco and the valley there is a highland pampa around the Inca village of Chinchero at 3,800m (12,500ft) with on the other side of the valley the Vilcanota Mountain range with its snowcapped mountains. The Urubamba River (also called Vilcanota River) is a long river coming from the Puno region and running to the Amazon Rainforest. 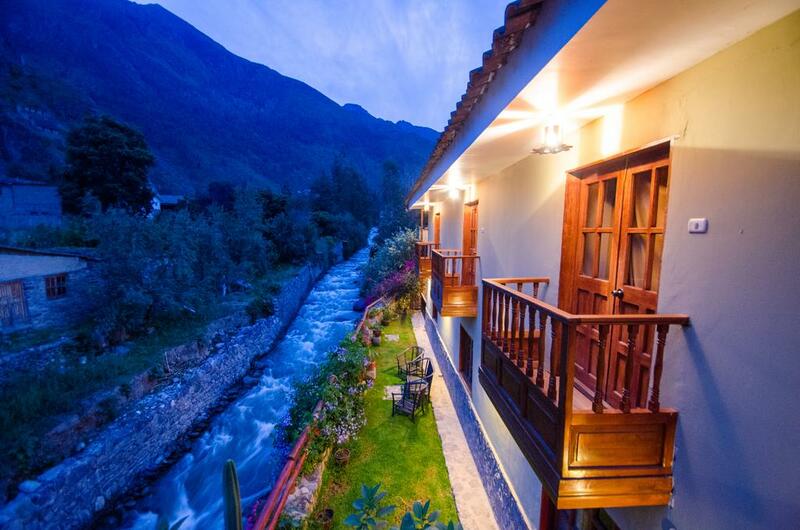 The part where it runs through the Urubamba valley from the town of Pisac to the town of Ollantaytambo is what nowadays is called the Sacred Valley of the Incas and the place known for its impressive archaeological sites, agricultural terraces and Inca ruins. The Sacred Valley is located at altitudes of 3,000m (9,800ft) in Pisac- to 2,500m (8,200ft) in Ollantaytambo and about 60km (37mi) Along the river there are dozens of small and larger villages. 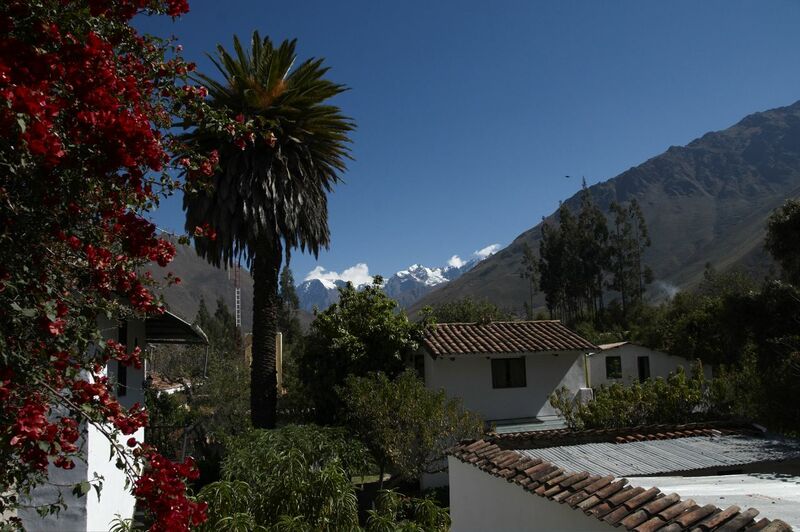 The largest are Pisac, Calca (capital), Urubamba and Ollantaytambo. 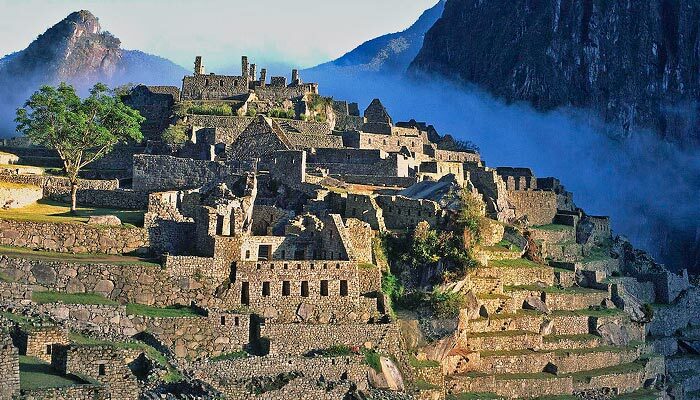 The town of Ollantaytambo is the town that survived from the days it was part of the Inca empire. 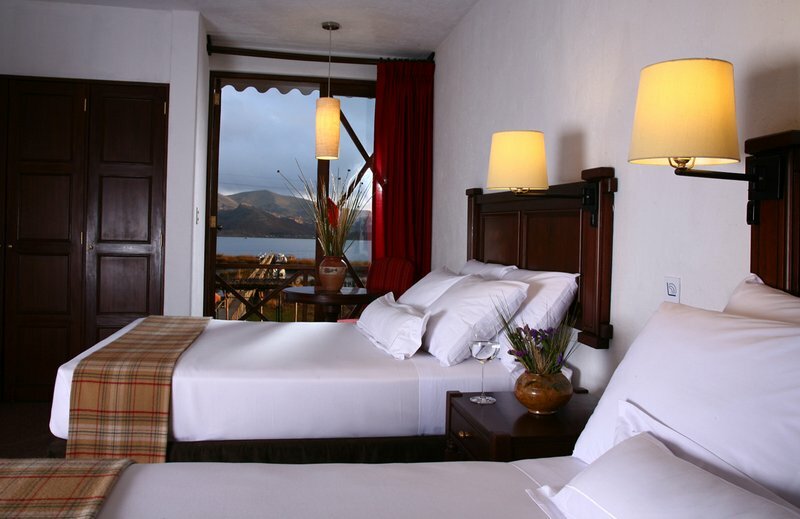 The villages are mostly found on the right bank of the river with the main bridges in Pisac and Urubamba. Flooding happens yearly and people anticipate this to fertilize the lands. Nevertheless, in some years flash floods due to increased rain in the higher lying areas can occur. As all this water runs through to Machu Picchu where it is called the Vilcanota River this means that the town of Aguas Calientes also knows some sporadic flooding. 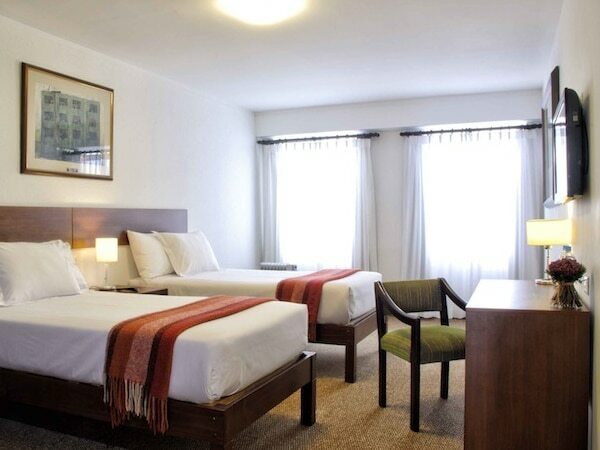 The Sacred Valley of the Incas, conveniently located close to the city of Cusco, offers a little bit of everything that one can look for when coming to Peru; Inca ruins, Andean culture, wildlife, outdoors, shopping and gastronomy. One could spend weeks exploring this beautiful region but as most people’s time is limited, the valley is mostly visited en route to Machu Picchu. 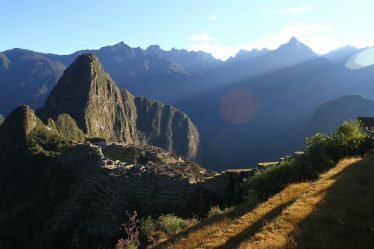 Nevertheless we would recommend visiting at least some of the local villages, the Inca citadels and of course take in the views. 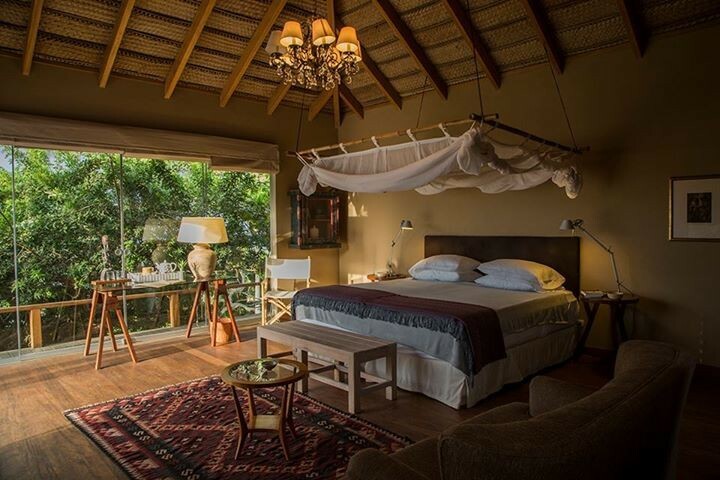 If time allows outdoors activities such as horseback riding, mountain biking, quad biking, wild water rafting, zip line or hiking would for sure add up to your vacation experience. 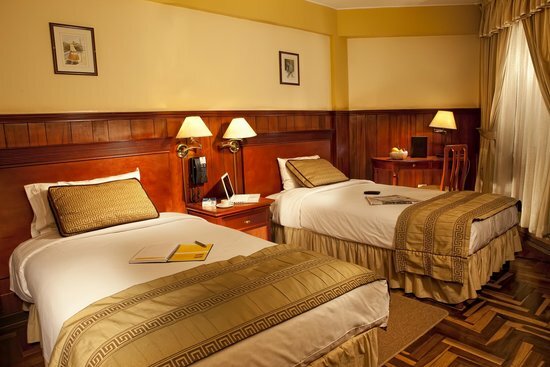 Distances are not that large so the Ollantaytambo and Pisac ruins can easily be visited in a day trip. 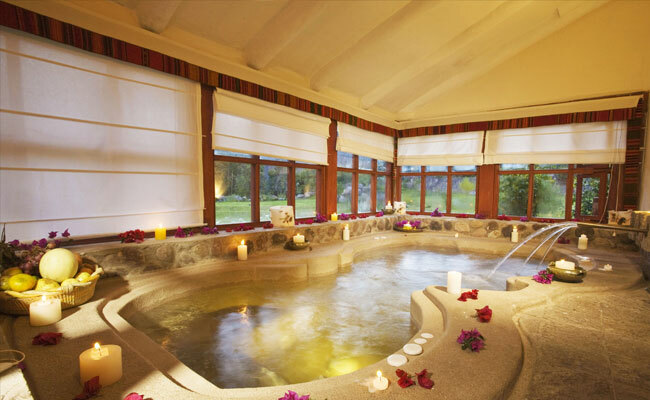 Visiting Maras, Moray and Chinchero would require another day ideally. Shopping can best be done at the weekly markets in these Andean villages. 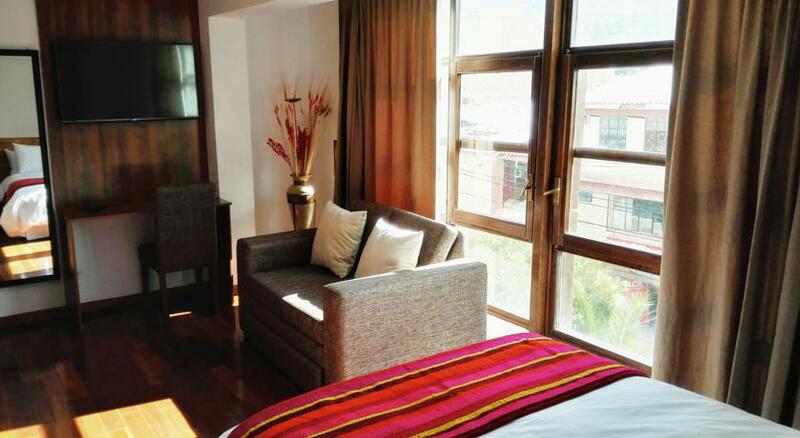 Pisac or the even more authentic market of Chinchero are probably the best options. 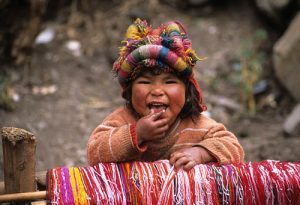 The Pisac artisan market is open every day but most interesting on Tuesday, Thursday and Sunday. On these days the market also hosts the typical local farmers market during which the local farmers come down to the market to barter and sell their products. The Chinchero market is also an artisan as well as farmers market but is only open on Sunday’s. 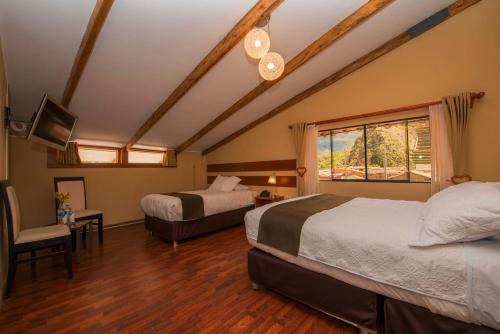 For outdoors activities there are many options such as hiking through the beautiful countryside, rafting on the Urubamba River. Multi Day or one day hikes visiting lesser known ruins or amazing mountain lakes and communities are also possible in the Sacred Valley. Other excursions such as visiting Maras & Moray on mountain or quad bike are also highly recommended. 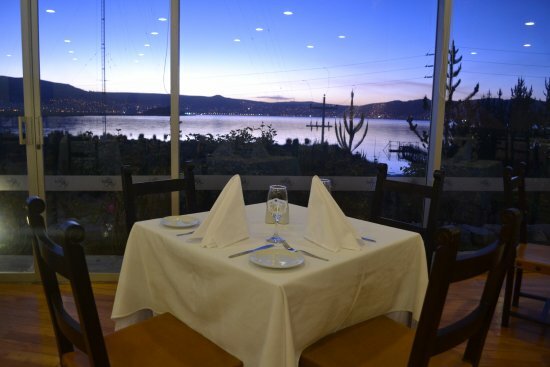 Finally the valley also cares of the foodies with some great local typical restaurants for some nutritious Andean grub or gourmet fine dining.